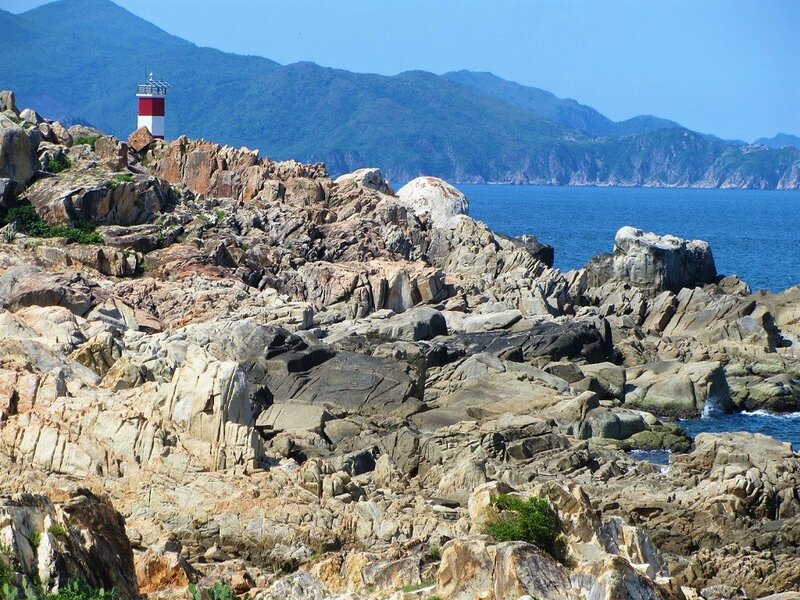 The coast of Phu Yen Province and Quy Nhon, in south-central Vietnam, is ripe for exploration. Its potential is extraordinary: An irresistible, honey-combed coastline with long peninsulas, rocky outcrops, dramatic bluffs, forested hills falling to the ocean, secluded bays, arcing beaches, rugged islands, thriving fishing villages, coastal cities, and glistening, calm seas. 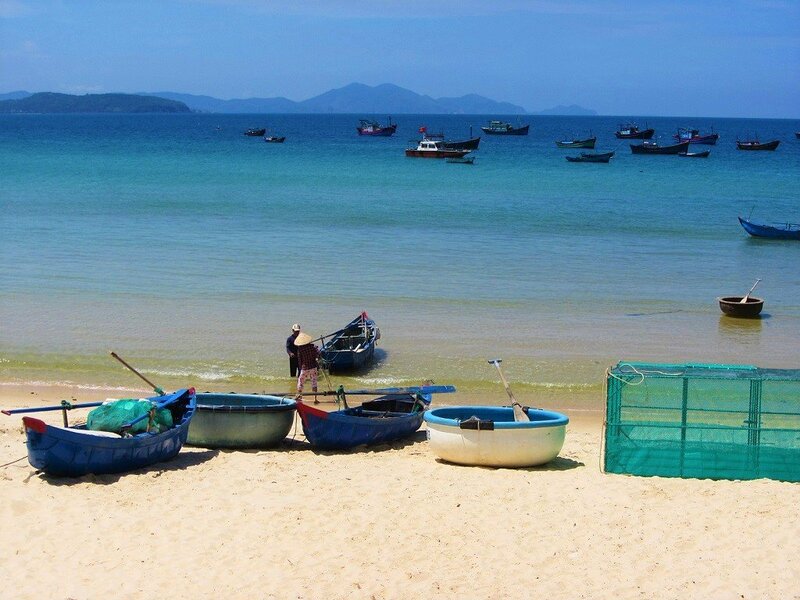 This coastal region is destined to be an extremely big deal: a star of Vietnam’s beach scene. 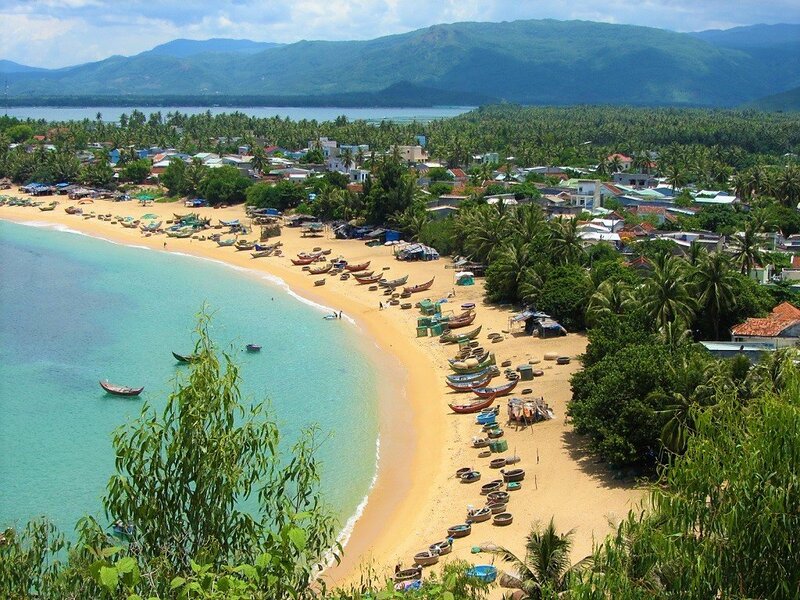 But, despite a surge of interest in the last few years, the coastline of Phu Yen and Quy Nhon has yet to be developed for mass tourism, and is thus far more serene, local, sparsely populated, and ‘genuine’ than Vietnam’s other ‘beach darlings’, such as Nha Trang and Phu Quoc. As always, the window of opportunity for travel to this region before it inevitably turns to mass tourism is short: already the crowds, the coaches, the cement trucks, and the international resort chains are arriving. If you’re an independent traveller, don’t wait: go now. *Please support Vietnam Coracle: If you use the relevant links in the following guide to book your accommodation & transportation in Phu Yen & Quy Nhon, I make a small commission. All my earnings go straight back into this website. Thank you. Although steadily gaining ground, Phu Yen and Quy Nhon are still part of Vietnam’s off-the-beaten-path beach scene. It’s a fabulous area that’s just begging to be explored. There’s a still, slow, silent – almost holy – quality to parts of this region. One can imagine it as the setting for ancient parables. 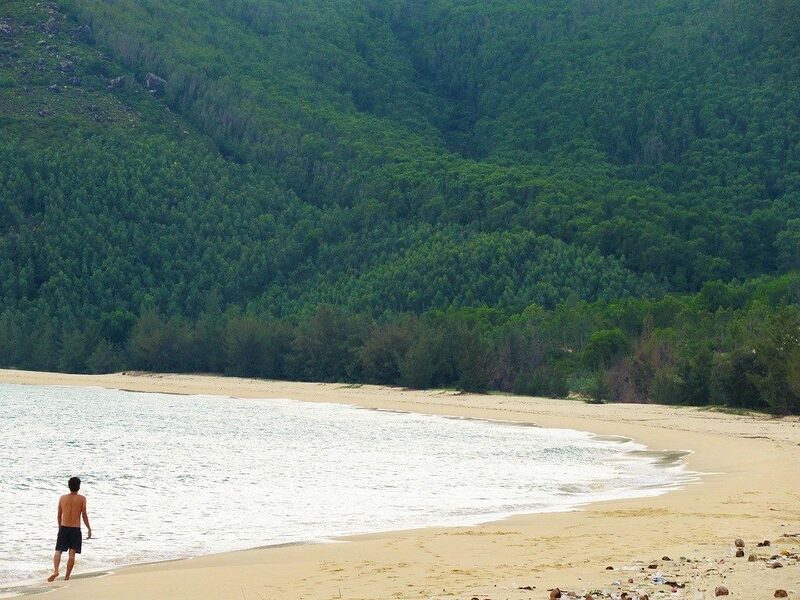 Indeed, its character befits its name: Phú Yên means ‘Rich Peace’. And, to some extent, this part of the country is bound up with the history and legend of Vietnam. The Cham Kingdom ruled from the city of Vijaya until the 15th century, and then, in the late 18th century, the Tay Son brothers rose up from near present-day Quy Nhon to overthrow the ruling imperial dynasty; a rebellion that is often portrayed as the precursor to the great nationalist-socialist independence movement of the 20th century, against the French and the Americans. 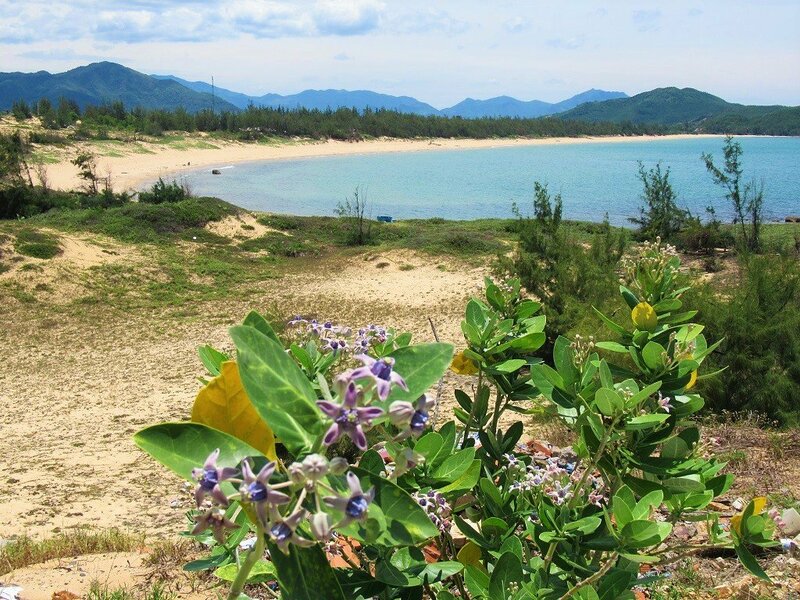 The popularity of Phu Yen’s and Quy Nhon’s coastline has been rapidly growing over the last few years, especially among domestic travellers. Its reputation was boosted when the Vietnamese movie, Tôi Thấy Hoa Vàng Trên Cỏ Xanh (I See Yellow Flowers on the Green Grass), directed by Victor Vũ and released in 2015, chose Phu Yen as a filming location for much of the movie, including a now-famous beach scene on Bãi Xép. 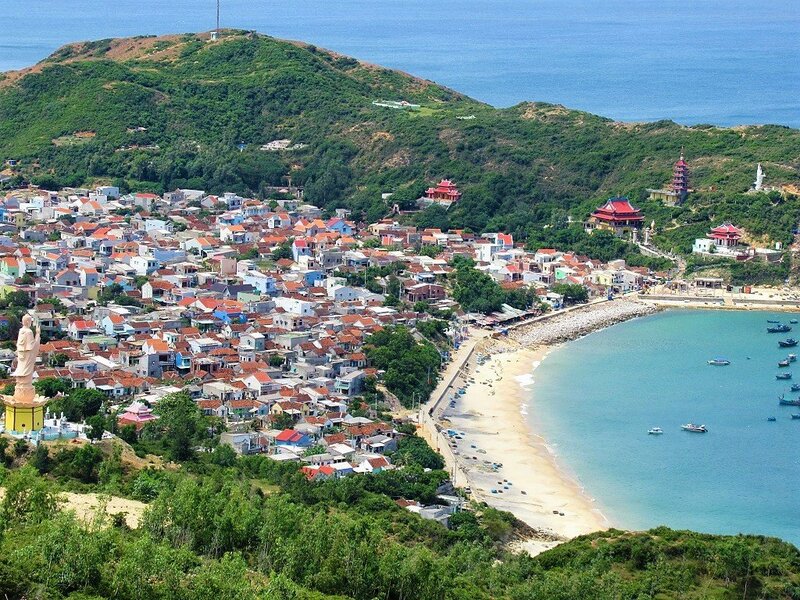 But foreign travellers, too, who traditionally skipped the area on their way between Nha Trang and Hoi An, have started to discover the serene beauty and great beaches of Phu Yen and Quy Nhon. Thus, the area is on the cusp of big changes: several travellers’ enclaves have already sprung up, and investment is starting to pour in for the development of its fabulous beaches. 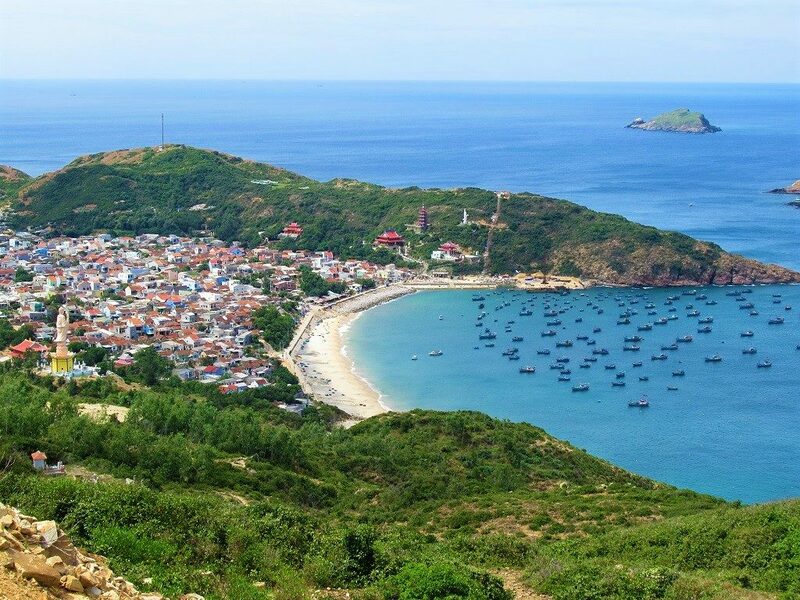 Much like Phu Quoc Island 10-15 years ago, now is the time to visit Phu Yen and Quy Nhon, before the beaches are cordoned off for development and isolated fishing communities fade away. Phu Yen Province is bounded by the Cả Pass to the south and the Cù Mông Pass to the north, over which lies Quy Nhon and the province of Binh Dinh. 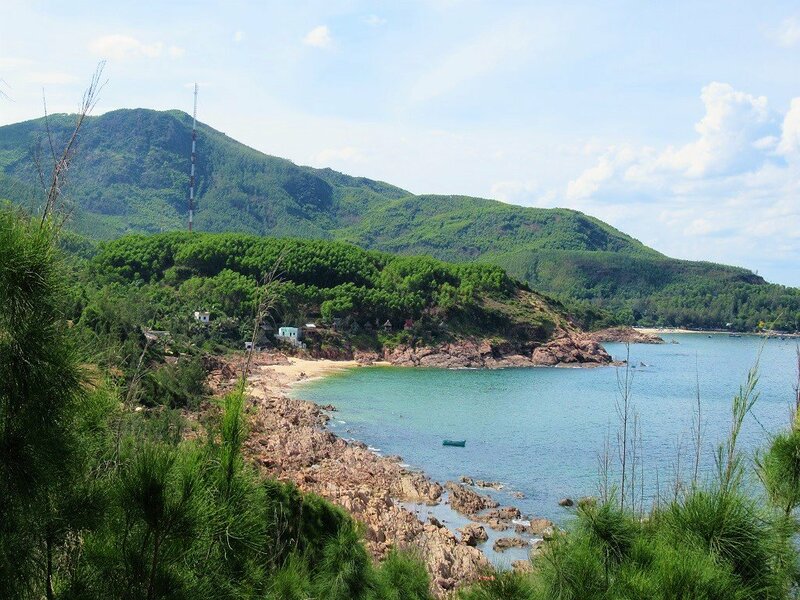 Although Phu Yen Province is roughly 70% highlands (the mountains in this region reach nearly 1,600m [5,250ft]), it’s the coastline that most people come here for. And this mountainous topography makes those beaches all the more spectacular, as the steep, rocky – sometimes forested – slopes slide into the ocean in dramatic fashion, creating dozens of sheltered bays, rocky coves, and crescents of sand book-ended by rugged outcrops. The Đà Rằng River, the largest in Central Vietnam, flows out to the sea at Tuy Hoa (capital of Phu Yen Province) in a great, gaping estuary. Even when I first travelled here, on my bicycle in 2005, I was struck by the width and scale of this great river mouth. Once it provided a trade route to the interior for the Kingdom of Champa, but now its flow is greatly reduced, partly due to large dams upstream. Much of the south-central coast is reminiscent of Greece. 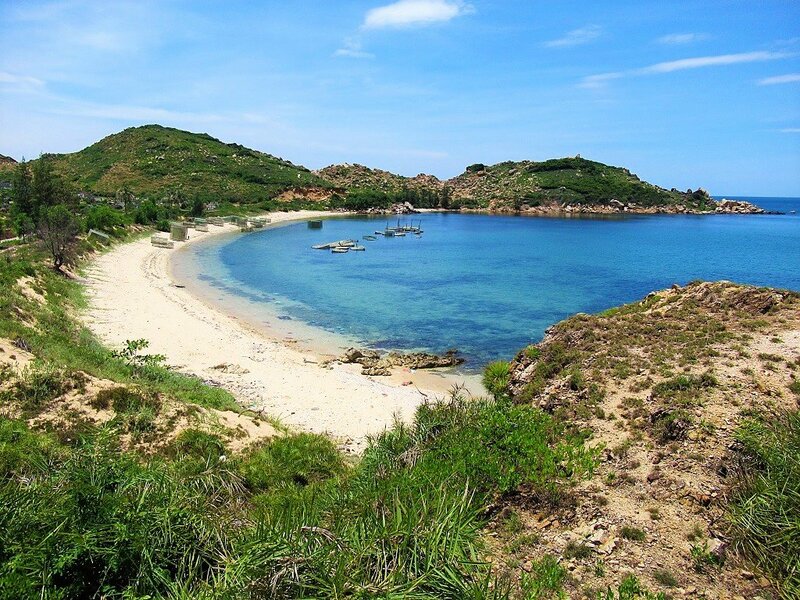 Indeed, there’s something Homeric about it: the “wooded” Ionian Islands remind me of the eucalyptus-studded coast south of Quy Nhon, and the stark, arid beauty of the Cyclades reminds me of the dry, sand-strewn coast north of Quy Nhon. I travelled regularly to Greece from a young age, and studied its history at university, and I’ve always been struck by the resemblance ever since I first started visiting Vietnam’s coast, in 2005. And, like the Greece that I visited as a child, the south-central coast suffers from coastal pollution. It’s a huge problem all over Vietnam, but on the coast, especially in the fishing villages, it’s at its most shocking. The polystyrene, the plastic, the sewage, the household garbage, the stench: the horror. It’s an appalling mess. Visitors should be aware of this. 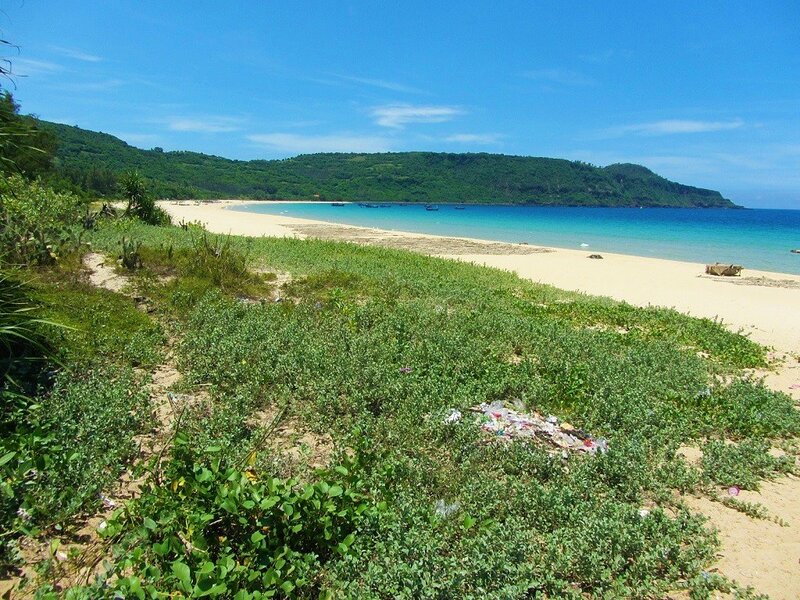 The beaches that already have some kind of tourist infrastructure are generally kept clean, but once you venture off the beaten path, to secluded bays and fishing hamlets, you need to expect a certain level of trash. These are working beaches, fishing beaches, and fishing is an industry that creates a lot of waste. Hopefully, like Greece, the problem will be addressed soon. 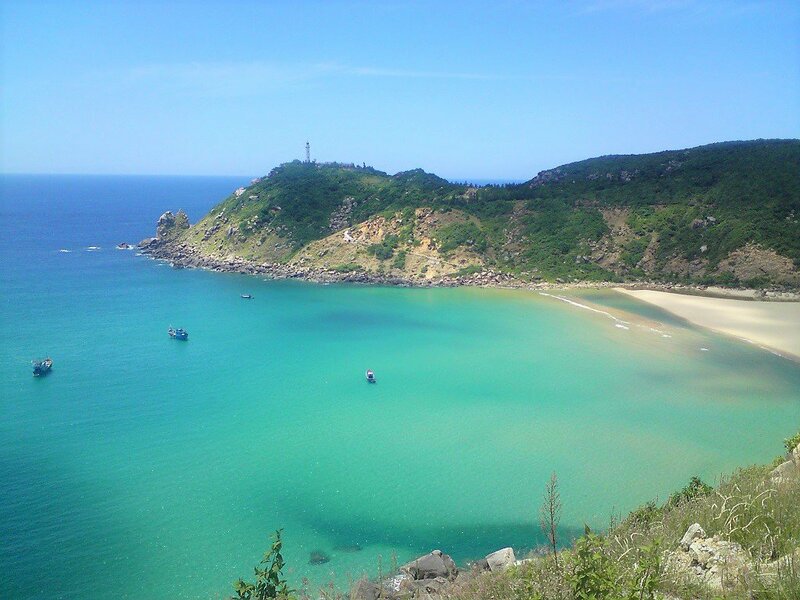 Below is a list of beaches, bays, islands, and peninsulas in Phu Yen and Quy Nhon. I’ve written a description of each one, as if travelling from south to north along the coast. Each beach is illustrated with a photograph, and all of the places below are marked on my map, as are the roads and lanes to access them (if you have your own wheels). In the descriptions, I’ve included some recommendations of places to eat and drink, but for places to sleep go to my Accommodation section. 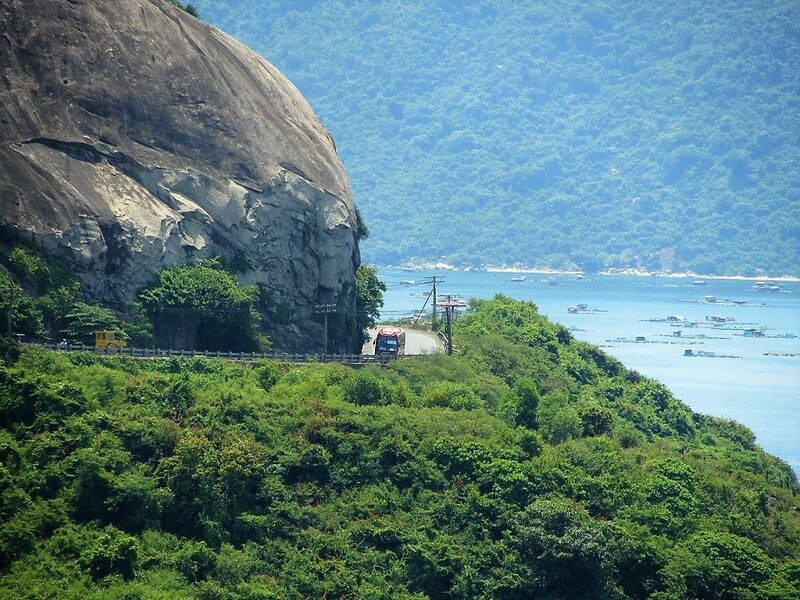 Coastal Phu Yen Province begins at the top of the spectacular Cả Pass. From here, the views down to Vung Ro Bay are glorious. 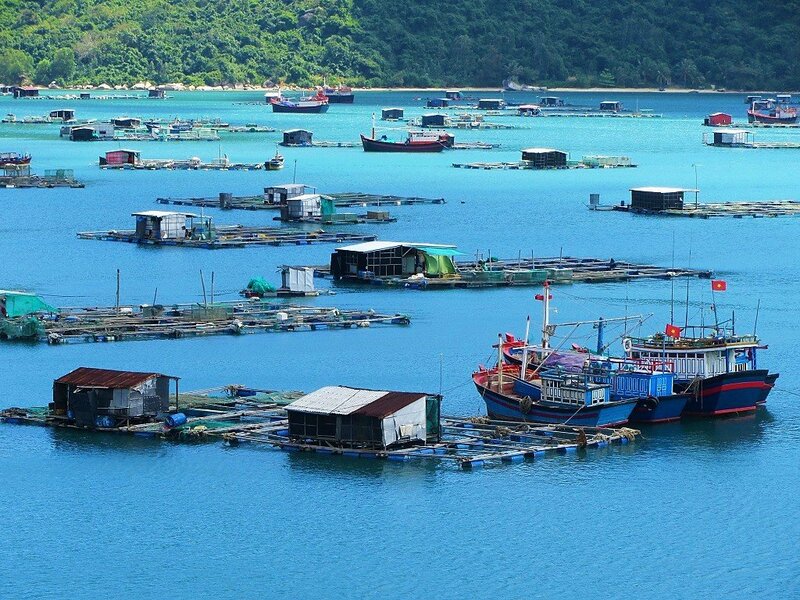 Spreading between green mountains, Vung Ro Bay is a perfect blue lagoon, dotted with fishing boats, floating fish farms, and a handful of cargo ships. From the top of the Cả Pass, a road leads steeply down to the bay and follows the shore. Several floating restaurants (bè nổi) are accessed by boat and serve fresh seafood in wooden structures on the calm waters. Visible to the south of the bay is Hon Nua Island, a rugged little isle with dramatic cliffs on one side and a good beach on the other. It’s possible to charter a boat to the island from the floating seafood restaurants, or from Dai Lanh Beach. Heading north from Mon Beach, the coast road meanders down a strikingly scenic, rocky hillside, giving way to pretty coves and crescents of sand, and a wonderful vista over the long, empty beach of Bai Goc. From here, the sand essentially stretches all the way to Tuy Hoa city (25km), broken only by a couple of river estuaries. There’s no development here yet, but much of the coastline is given over to shrimp farms. Several fishing villages line the road, and the inlets are filled with the blue-painted boats of the local fishing fleet. Most of the road is in excellent condition, much of it brand new as it passes behind Tuy Hoa Airport. All of this, of course, suggests that there are big plans for the future development of this coastal region. Accessed from the south via an impressively long bridge, Tuy Hoa is a pleasant city on the flood plains of the Da Rang river estuary. Although very few travellers spend any time here, Tuy Hoa’s wide main streets (on an easy to navigate grid system) lead from the bustling city centre to the extensive municipal beach. During the spring and summer months, the beach is excellent for swimming. The newly refurbished beachfront promenade boasts lots of trees, kitsch sculpture parks, and public showers. There’s virtually no one here during the daytime. 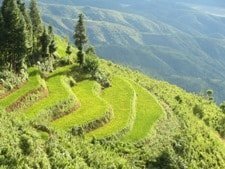 In town, you can pay a visit to the Thap Nhan Cham temple (dating from the 14th century), tuck into some fresh seafood at the string of local riverfront restaurants, drop into Tuy Hoa Market, and even ride up the helter-skelter lane to the top of Chop Chai Hill for some extraordinary panoramic views. If you’re craving Western food, stop by at Bob’s American Cafe. Accommodation options are good and plentiful. 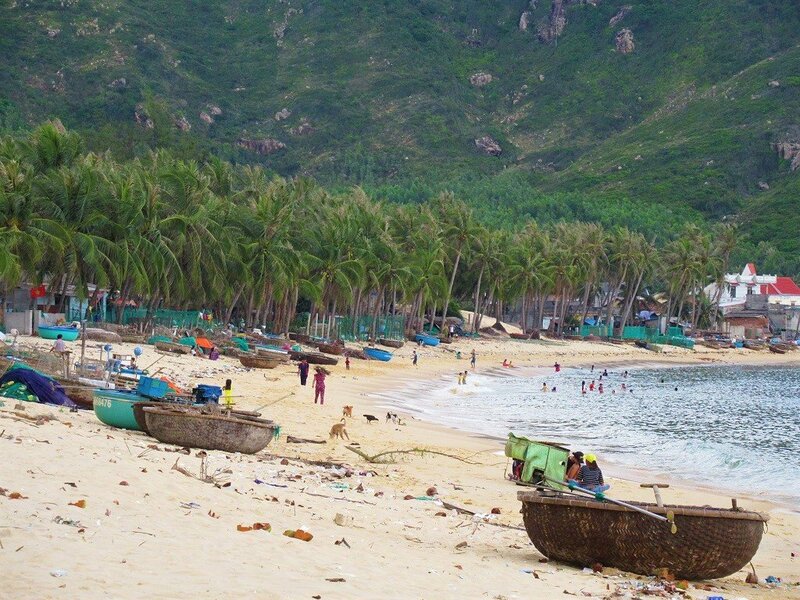 As Tuy Hoa is one of the two cities on this stretch of coast (the other being Quy Nhon), it’s a transport hub for travel within the region and beyond. Connections by rail, road, and air are all good – see Getting There & Around for details. Heading north on Le Duan Street along the coast from Tuy Hoa, past the concrete skeletons of huge resorts under construction, small lanes lead off the road to Long Thuy, a little fishing village at the northern end of what is essentially Tuy Hoa Beach. 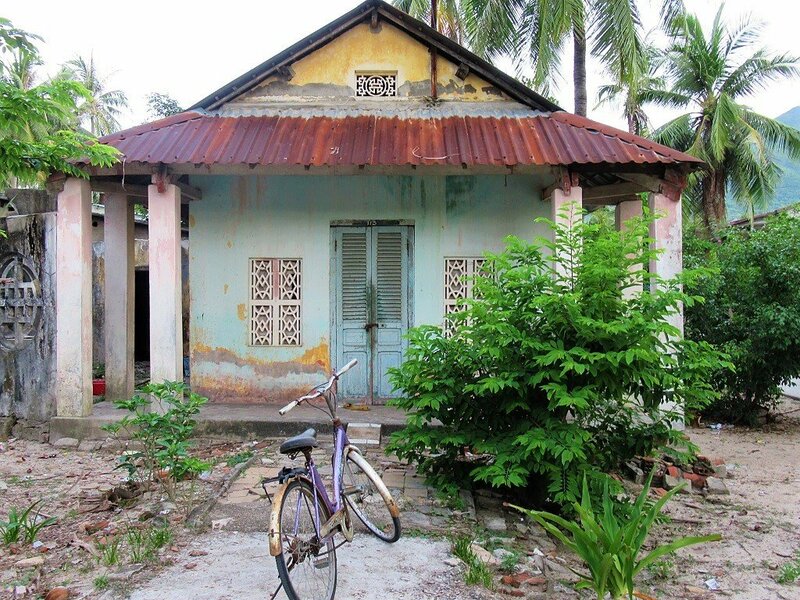 Long Thuy is notable for its interesting narrow backstreets, lined with crumbling homes, small temples, and cowsheds. Although the beach here is nice, it’s currently undergoing renovations: the construction of a seafront promenade. From the beach, it’s possible to charter boats out to Hon Chua and Hon Dua islands, lying just offshore. There are a couple of seafront restaurants and mini-hotels on the seafront (see Accommodation). 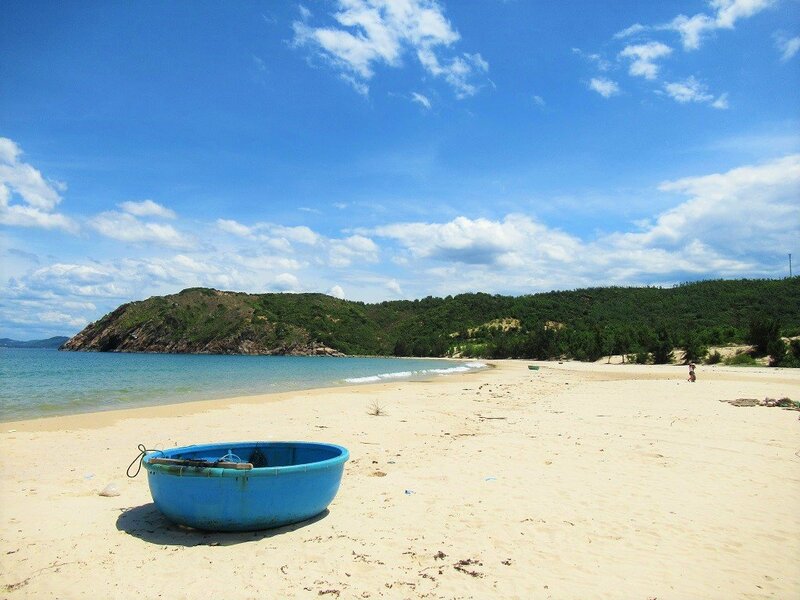 For more about Long Thuy Beach see this guide. Follow the back-roads just north of Long Thuy village. A network of narrow lanes leads through a cluster of fishing communities gathered beside a long beach. The small, cramped houses are so tightly packed that there isn’t any easy access to the beach. But when the lane turns to concrete slabs and leads over a hill, the space suddenly opens up, and Bai Xep Beach comes into view. Famous among Vietnamese film buffs as the location for the 2015 movie, Tôi Thấy Hoa Vàng Trên Cỏ Xanh (I See Yellow Flowers on the Green Grass), this is a lovely little beach of white sand, bookended by rocky bluffs. A sign with images from the movie announces your arrival at the entrance to the beach (there’s a small admission fee). A pathway leads down to the sand, where a thatched structure offers food, drinks, sun-loungers, and beach toys for fairly reasonable prices. Walking trails head to the top of the cliff, known as Ganh Ong, at the north end of the beach, from where there are beautiful views over the coastline. The swimming and general setting of Bai Xep are very nice indeed, but it can get very busy on weekends and public holidays with domestic tour groups, and trash is, predictably, becoming a problem. Continuing north of Bai Xep Beach, the road veers slightly to the east, as it begins to follow a long and topographically complex peninsula, created by an inlet and a large lagoon. The unique and interesting terrain in this area is partly a result of ancient volcanic eruptions, which pushed rivers of molten lava down towards the sea. There are lots of interesting rock formations, cliffs, hidden coves, and wonderful beaches around here. 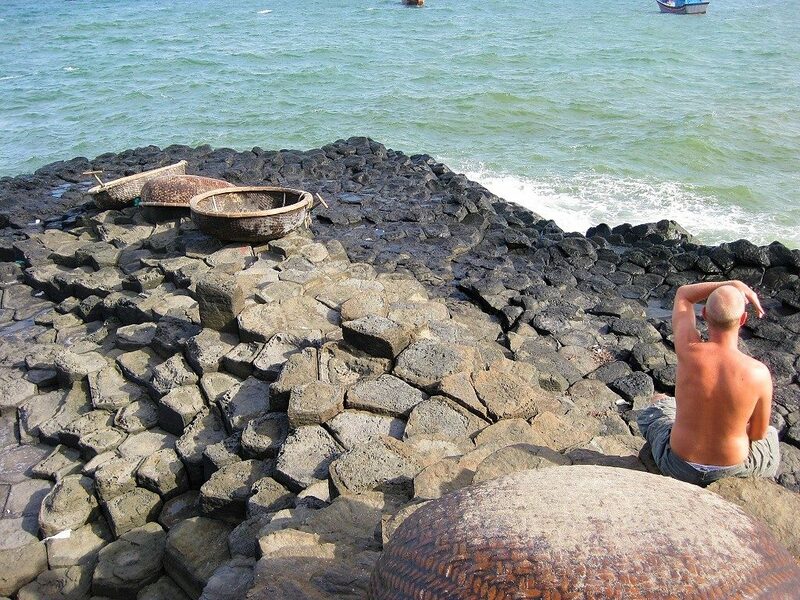 By taking a series of small, paved lanes east toward the sea, you’ll eventually come to Mũi Yến, a beautiful and very peaceful spot at the tip of a headland which almost touches Hòn Yến, a rocky islet comprised of geometric volcanic rock formations. Mui Yen has a few local cafes, some with hammocks under tropical almond trees, where you can swing in the sea breeze, drinking a coconut while taking in the views over the picturesque coastal scene. Swimming and snorkeling are both good here, but be careful of sharp rocks. It’s possible to practically walk over to Hon Yen Islet, but the cafes can also arrange for a coracle to row you across. Surrounding the cape there are fishing boats and lobster cages. It’s a really lovely little spot: there’s something timeless and poetic it. 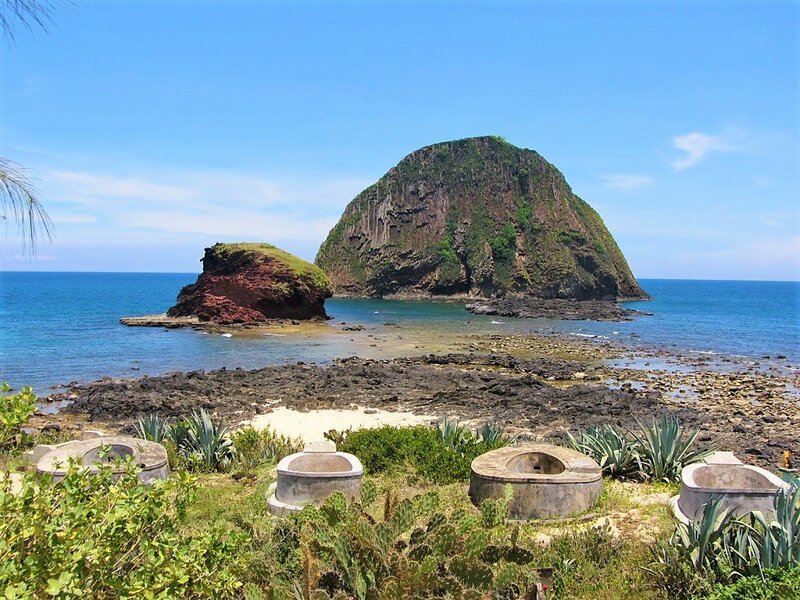 A small shrine sits atop the sandy cape, below which a collection of Chinese-style circular tombs cluster around the volcanic rocks leading down to the sea, watched over by the black wall of rock on Hon Yen Islet. On the lane just before reaching Mui Yen Cape, there are a couple of good bánh bèo stalls (little dishes of savoury rice flour curd; a speciality of Central Vietnam). 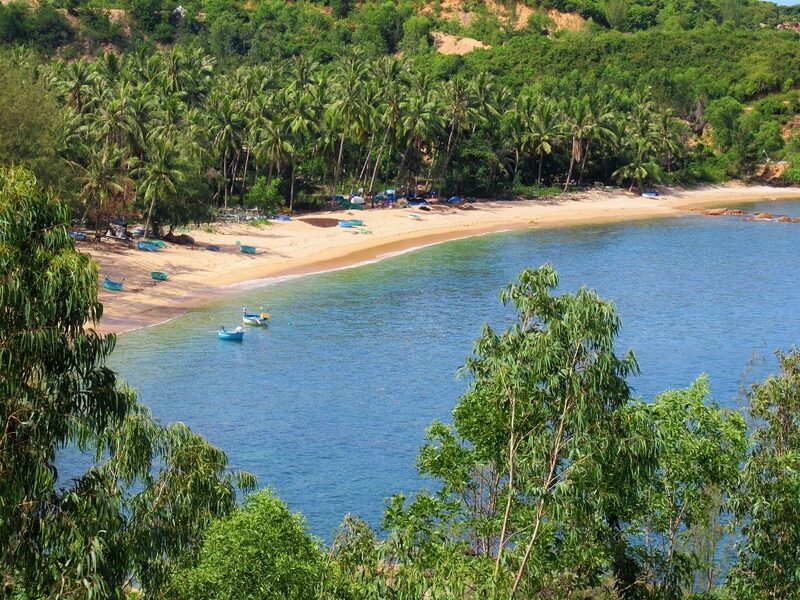 Just around the north side of Mui Yen Cape, accessed via more narrow lanes, is Yen Beach, a long, gorgeous sweep of sand between two volcanic cliffs. It’s a stunning setting, and as yet there’s no development whatsoever. Lap it up while you still can, because this beach has ‘International Luxury Hotel Chain’ written all over it. 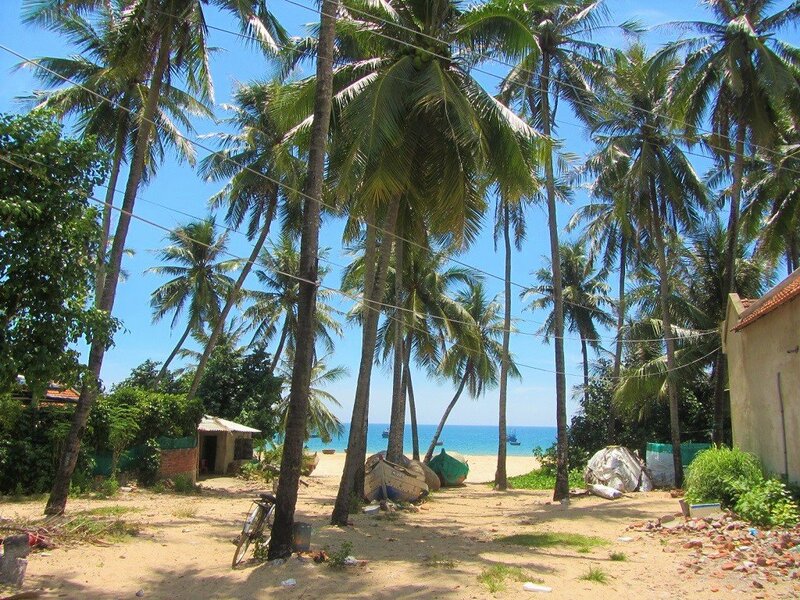 There are a couple of access points to the beach: one of them leads to a giant old tropical almond tree growing by a village temple, where women and children gather in the shade to eat and sell street snacks in the afternoons, while the fishermen tend to their nets on the sand. The swimming all along Yen Beach is marvellous. More quiet, rural back-roads wind over a volcanic bluff jutting into the sea north of Yen Beach. Potholes mark the road surface as it passes through isolated farming and fishing communities. Haystacks, arranged in pylons, lie by the roadside with cattle munching at them, while children play in the sandy front yards of small, brick and red-tile-roofed homes. At An Hai village there’s a sizable fishing fleet moored offshore, with the smaller vessels drawn up on the sand. Good beaches spread either side on the small headland here, stretching for kilometres in both directions. The beach on the north side is cleaner and calmer, with a few fishermen’s homes by the water, several fishing canoes, lobster cages on the beach, and a collection of large, smooth boulders. On the southern beach, by the village, you can hire a boat to take you across to Cu Lao Mai Nha Islet, a rugged but green isle just across the water. Another back-road heads inland north of the village to a new bridge across an inlet, where there are lots of floating restaurants serving good seafood. This makes a convenient lunch stop. West of here, Dam O Loan Lagoon is worth exploring if you have some extra time. If not, continue over the bridge and along the straight road through casuarina trees towards the volcanic cliffs of Da Dia. 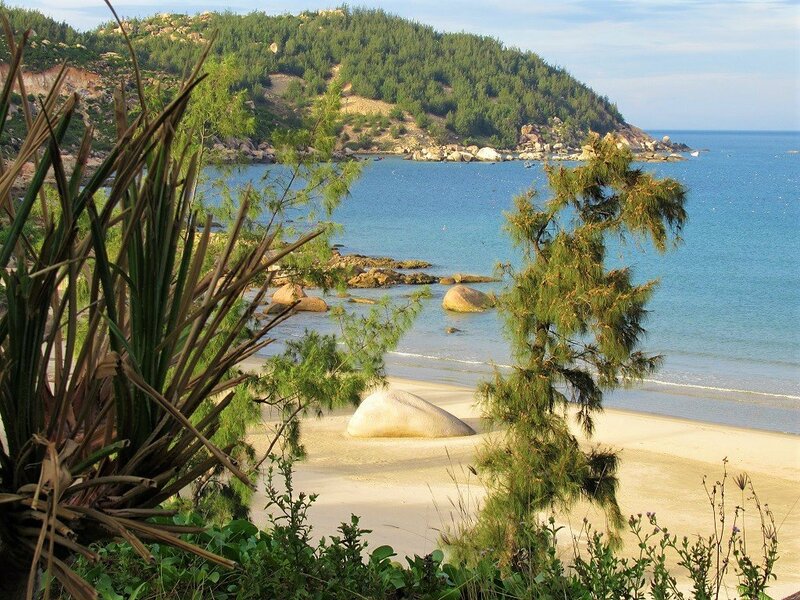 Ganh Da Dia is a hook of land at the northern tip of the long peninsula which starts just above Tuy Hoa. Accessed via a series of pretty country roads, some of which are currently in quite poor condition, the volcanic cliffs of Da Dia are a popular attraction for domestic road-trippers and tour groups. Despite getting very busy on weekends and public holidays, there’s generally only a trickle of visitors on the weekdays. Like much of the topography in this region, the cliffs of Da Dia were formed when a volcanic eruption caused a river of molten lava to run downhill to the sea, where it met the cooler temperatures of the water and became the solid, eerily geometric rock formations that it’s now famous for. When I first visited, about 10 years ago, there was nothing here but the cliffs themselves. These days, however, an entrance gate has been erected (and an entrance fee charged: 20,000vnd), a plank walkway constructed around the rock formations, and a parking lot to accommodate all the coaches and cars. It’s a fairly untidy sprawl of temporary food and drink shacks, souvenir stalls, and piles of trash. However, the setting is still very scenic and the cliffs are impressive, so it’s definitely worth the trip. Da Dia Beach, stretching south of the cliffs, is a gorgeous sweep of sand. It’s good for bathing, and there are a few food and drink shacks along its shores. North of the cliffs, a paved pathway leads across a grassy, boulder-strew coastline to a Ganh Den Lighthouse. An attractive and peaceful spot with views over the bay, this has become a selfie-trap for many young Vietnamese travellers. I camped here with my friends, overlooking the jagged shoreline, back in 2008. Sadly, there’s now quite a lot of trash lying around: polystyrene food containers, beer cans, soda bottles. It’s such a shame, because the groups of young people here seem to take such pleasure in their natural surroundings, only to leave their litter behind. The cliffs of Da Dia are easily accessed from the south or west via decent roads, but there are also two interesting alternative routes in either direction (see the red lines on my map). From the south, it’s possible to cut through An Ninh Dong hamlet and over the hill, ending up on Da Dia Beach. However, there’s a small section of off-road involved: it should be fine in dry weather, but best avoided in wet conditions. From the northwest, a long wooden-plank and bamboo bridge (two wheeled vehicles only: 5,000vnd toll) crosses the Phu Ngan river estuary from Highway QL1A. On the other side, there’s a short section of muddy road before a good, paved road leads through rice paddies and eventually joins the main route to Da Dia Cliffs. The villages that dot the extensive cultivated plain between Da Dia and Chi Thanh, on Highway QL1A, serve some good street food in the afternoons, including bánh xèo (savoury rice flour pancakes). 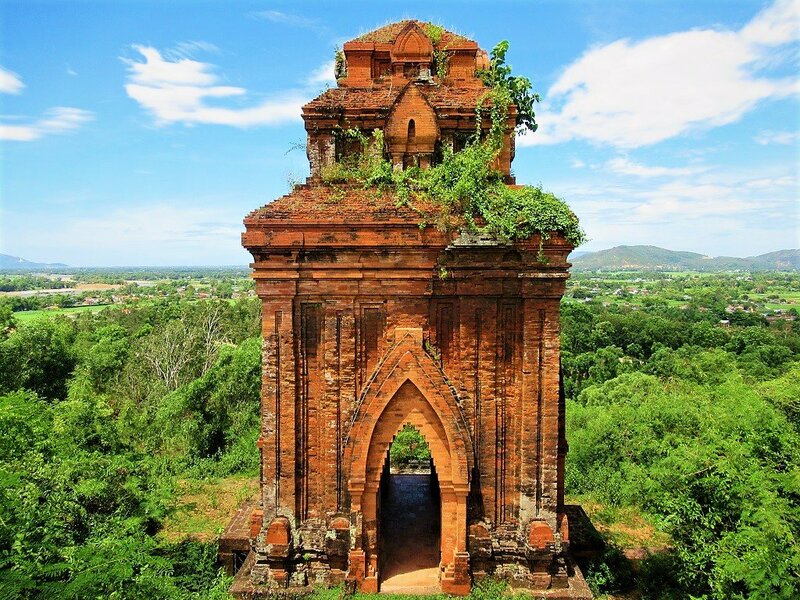 There’s also a mysterious old citadel near Chi Thanh, between the north bank of the Phu Ngan River and Highway QL1A. The scant remains of An Tho Citadel (dating from the early 19th century) can be seen at the museum at the centre of the moated, walled enclosure. There’s not much to see, but there’s an appealingly calm, forgotten atmosphere to the place, and it’s very lush. After the bamboo bridge over the Phu Ngan River, join Highway QL1A heading north along the coast. This section of Vietnam’s infamous main artery is one of the most scenic of its entire length, passing a honeycombed coast of cliffs and bluffs, mountains and lagoons, islands and bays. From here all the way to Quy Nhon, Highway QL1A/1D is in great condition. But remember, despite the scenery, this is still the notorious Highway 1 where trucks roar past without a care for smaller vehicles, and long distance coaches cut the bends at ferocious speeds: ride carefully. The first beach along this section of the highway is Ganh Do, a long, arcing spit of sand. At its northern end are a few places to stay or stop for a drink and a swim. Before a steep pass leading over to Song Cau, there’s an optional back-road (see the red line on my map) that rounds a headland via a scruffy fishing village where there’s a jetty with boats to take you across the water to Nhat Tu Son Island. It only takes a couple of minutes to make the crossing and there’s a small beach on the rocky, green island. If the weather is good, it’s a worthwhile excursion. However, riding the road along the harbourfront here serves as a disturbing reminder of how out of control the waste-disposal situation is in Vietnam’s thousands of fishing communities: the mess is biblical. The volume of polystyrene boxes (for packaging fish in ice) and the viscosity of the black seawater is shocking. 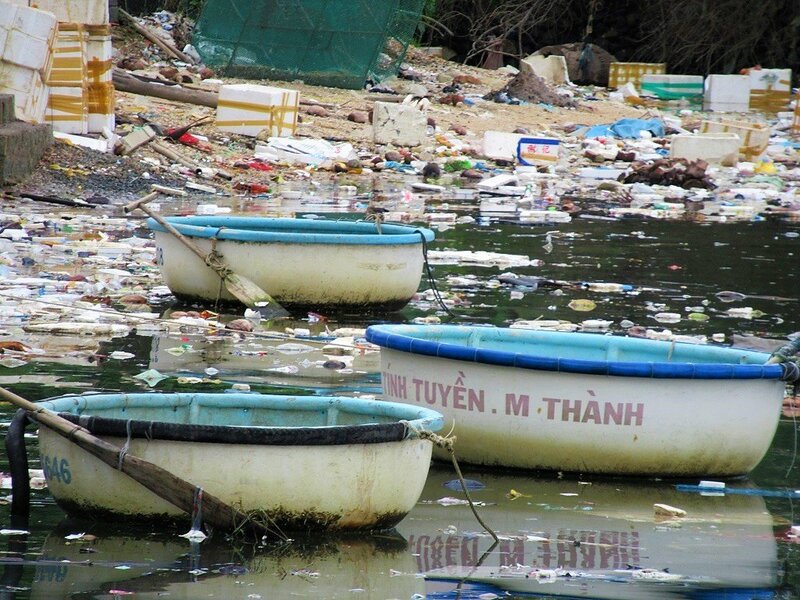 It’s the same story all along Vietnam’s coastline, and one wonders how anything can survive in these polluted waters. It’s a reminder that fishing is a messy (and big) business, and that fishermen in Vietnam are amongst the poorest people in the country. What the future holds for the people (and the fish) in communities like this, and how the ocean can cope, remains to be seen. Song Cau, in the middle of a great bay, is a fishing town through and through. It’s large fleet of wooden boats lies at anchor in the vast, flat, glassy Xuan Dai Bay, a scenic location for a fairly scruffy but likable little place. Song Cau’s fish market (chợ cá) is the real deal: a dilapidated structure teeming in the mornings with people and things from the sea. The fishy aroma is almost unbearable, and it’s probably best not to go wearing flip-flops, as the ground is wet, slippery and full of fish guts. If you can stomach it, this genuine fish market is worth a visit. Other than that, Song Cau’s lovely location belies what is a relatively unremarkable town. There’s some interesting architecture here and there: a few Soviet-looking government edifices and some ‘old’ houses, which, in fact, probably only date from the 1970s at most. 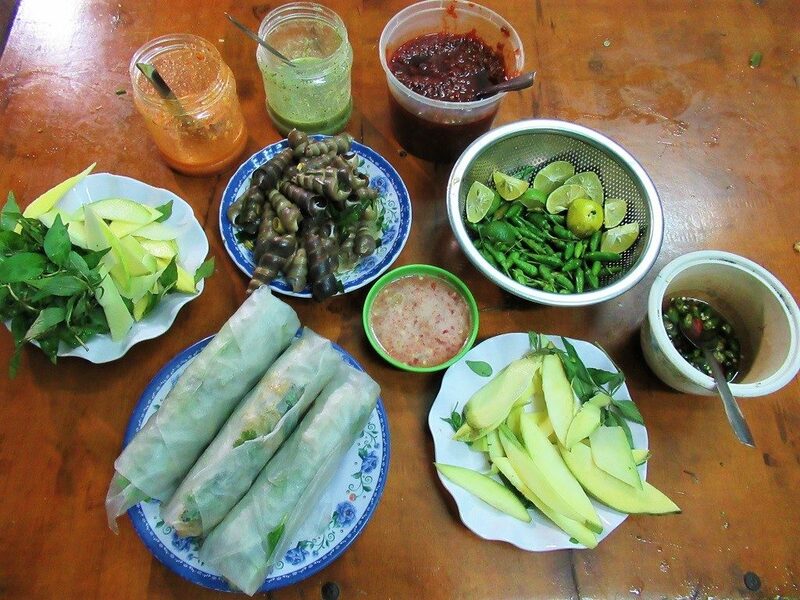 A spattering of decent street food stalls, especially around the main square, offer up some good snacks, like nem nướng (grilled pork wrapped in rice paper rolls), and fresh sea snails (ốc xào) in lemongrass, chilli and garlic. There’s a catholic churches, a handful of Buddhist pagodas, and some accommodation options, too. Opposite Song Cau, the Xuan Thinh Peninsular curls eastward and then south into the East Sea. A small road runs along most of the western and eastern sides of the peninsular, creating a scenic loop. Both roads can be accessed via concealed turn-offs from Highway QL1 (see the red lines on my map). This finger of land hides some extraordinary beaches and coves, none of which are currently developed. It’s ripe for exploration. On the western edge, the lane runs alongside the glassy waters of Xuan Dai Bay, facing the fishing town of Song Cau. The road, which consists of alternating sections of paved and dirt surfaces, is lined with coconut palms for much of the way, and offers access to isolated fishing communities, many of which farm lobster and shrimp. The setting is extremely picturesque, and there are several interesting local shrines and temples. But, as mentioned before, fishing is an industry that produces a lot of waste: in an enclosed, placid bay such as this, it won’t be long before it’s completely out of control. There appears to be very little awareness about waste in these isolated hamlets (although, again, there are government signs about it). Everything gets thrown in the water: plastic, chemicals, glass. These are fairly poor communities and people are just trying to make a living from the sea as best they can, but surely they won’t be able to sustain it much longer if the water pollution continues in this way. In general, the trash builds up in the waters that front the villages: away from these communities, the water is still good for swimming. Near the tip of the peninsular, a couple of small lanes lead down to very remote hamlets in stunning locations. The setting is pretty but life in the narrow warren of alleys on the polluted bay doesn’t look great. 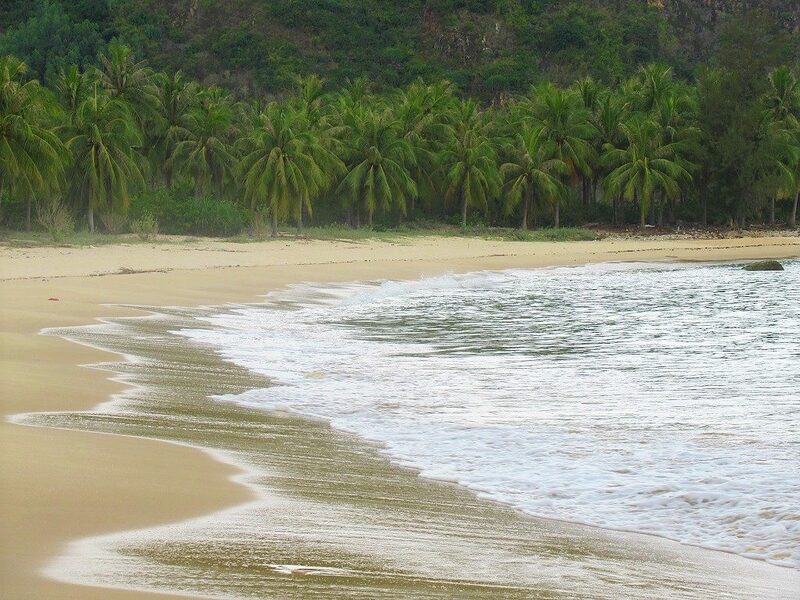 The holy grail of the entire area, Bai Om is a secluded beach of powdery sand perfectly pocketed between two rugged headlands and backed by coconut palms, right at the tip of the peninsular. 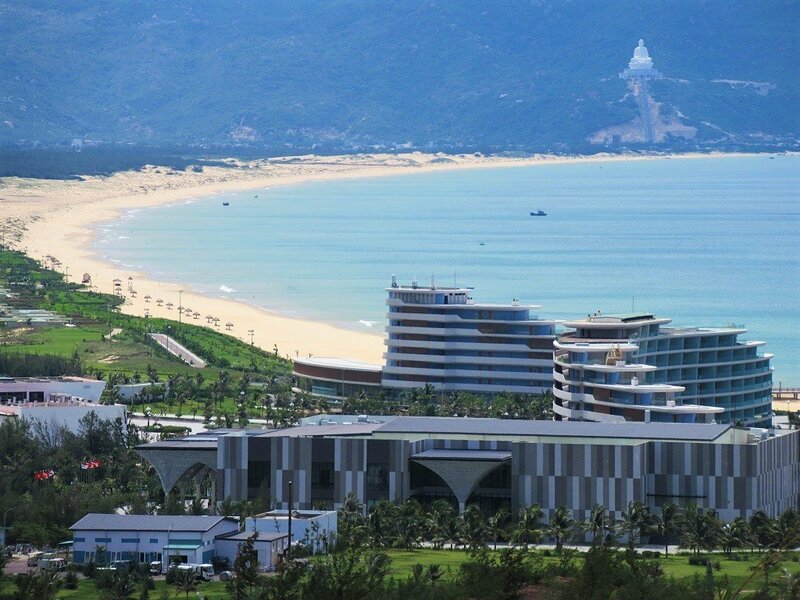 I would imagine that, one day, Bai Om will be the jewel in the crown of Phu Yen Province, developed, no doubt, by some exclusive and astronomically-priced resort company. But, for now, it’s empty. However, sections of the bay are used as a trash dump by the local community, so expect some plastic bags, glass beer bottles, and soda cans. It strikes me that the logistics exists to bring these products – the colas, the potato chips, the lagers – in to remote communities like this, but not out again once they’ve been consumed. A small road bisects the peninsular almost at the halfway point. Leading from west to east, the road rises sharply through eucalyptus trees, over sand dunes, and down onto the casuarina tree-lined beach of Tu Nham. On this side of the peninsular, the number of empty sand beaches is absurd: they stretch out in all directions, lined with palms and backed by wooded hills. Several scruffy but fascinating villages dot the bays and beaches: it’s worth setting aside at least half a day to explore the area. Again, these are mostly working beaches, so you’ll have to accept the trash. The tourist potential is huge, but for now there are only a couple of places to stay, all located on Vinh Hoa Beach, at the northeastern end of the peninsular. 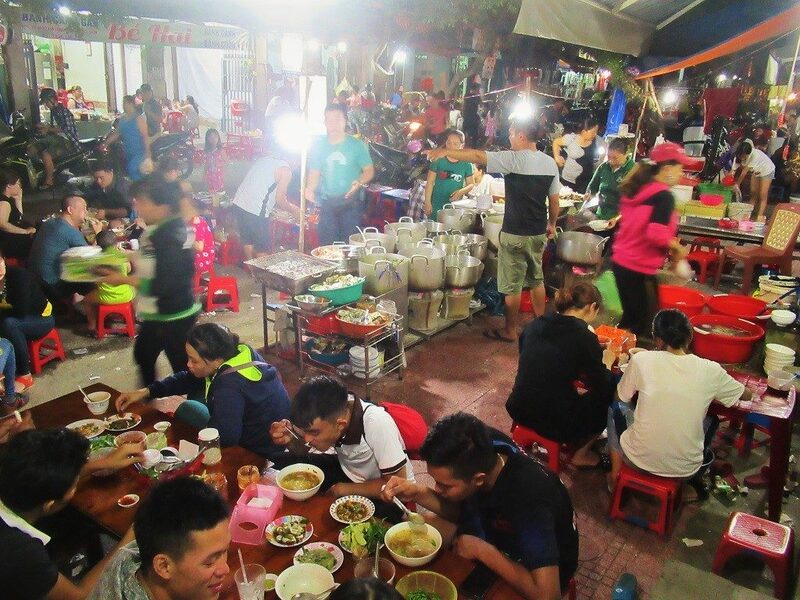 There isn’t much in the way of food and drink on Xuan Thinh Peninsular, but during meal times street food stalls pop up in the villages, as do local rice eateries. After rejoining Highway QL1A from the Xuan Thinh Peninsular, there’s yet another concealed turn onto a small lane, which leads to yet another astonishingly beautiful area of empty, undeveloped coast. Again, it’s possible to turn this excursion into a loop by threading a few back-roads together (see the red lines on my map). Turning east off the highway (near where all the roadside shops sell rượu cá ngựa – seahorse liquor), several quiet, paved lanes skirt the waterfront. Eventually, a new bridge leads over the Cu Mong Lagoon to Vinh Cuu Peninsular. Jutting south, two small fishing communities, Hoa Thanh and Hoa Loi, spread along both sides of this narrow finger of land. 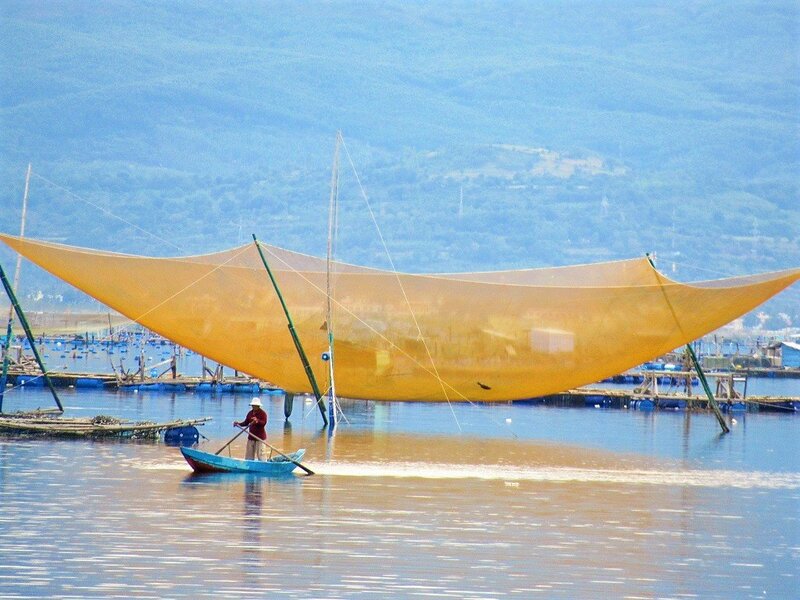 The west side fronts the lagoon, with lots fishing activity, including floating fish farms, shrimp nurseries, and lobster cages, as well as hundreds of small wooden fishing vessels and coracles. Looking back across the lagoon towards the mainland, forested mountains rise into the blue sky. 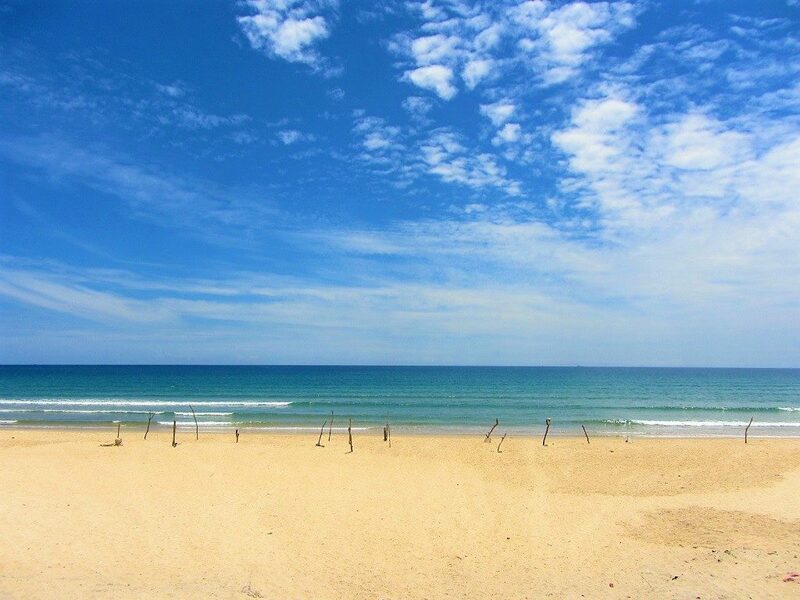 On the east side of the peninsular, a long, continuous beach, (confusingly called Tu Nham, the same as the long beach on Xuan Thinh Peninsular), stretches all the way to the tip of the headland. There’s no development here, just a couple of cafes, seafood shacks, and some fishing trash. Follow the road all the way to the tip, beyond the vast cemetery, and you’ll find a stunning crescent sand beach at the mouth of the Cu Mong Lagoon. Unfortunately, it’s marred by fishing trash, but you can be sure that, one day, people will be paying hundreds of dollars a night for the privilege on staying on this beach. The fishing hamlets on Vinh Cuu Peninsular are noticeably more affluent than those on Xuan Thinh Peninsular. In fact, they are beautiful little places: tidy, well-kept, calm, and very peaceful. Tucked away in a network of tight concrete lanes under towering coconut palms, the homes of fishing families stand on the sandy ground, awash with bougainvillea, allamanda flowers, and mango trees. Some of the homes are very pretty little villas from the 1970s, with wooden shutters and gated entrances. Family tombs, ancestor shrines, and Buddhist temples dot the hamlets. There’s a small fish market in Hoa Loi, where you can buy lobster straight off the boat for 750,000vnd ($30) a kilo, which will get you about three of them. 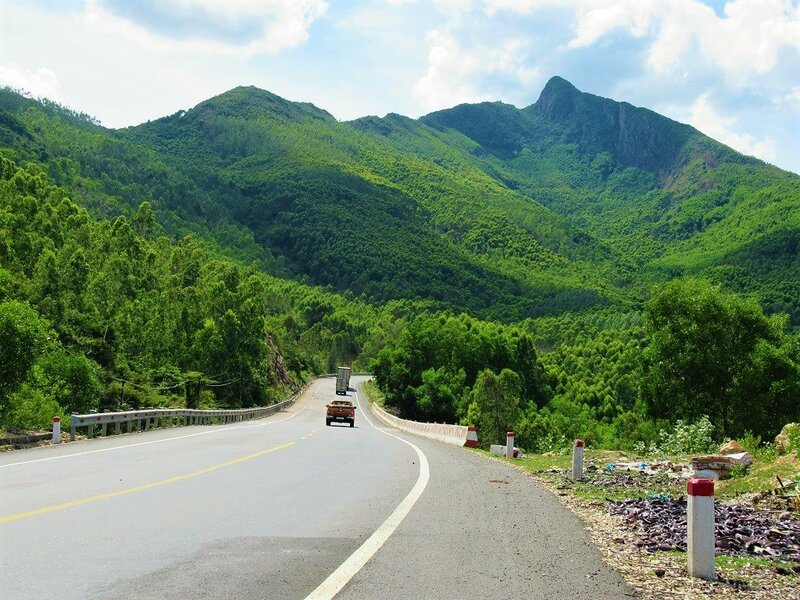 Heading north from Hoa Thanh village takes you to the turn for Bai Tram Resort. This exclusive place opened years ago, but is now closed for a major expansion. The beach here is superb, but no longer accessible. Continue northwest on the lane as it follows the shore of the lagoon and then heads inland over sand dunes before turning east to the remote hamlet of Hoa An, at the northern tip of the peninsular. This settlement is an assemblage of concrete dwellings accessed via extremely tight passageways: it’s enough to induce claustrophobia. There are beaches on either side of the hamlet, but Bai Nom, on the south side, is the most spectacular. A wedge of powdery white sand between two rocky headlands, the swimming here is great. 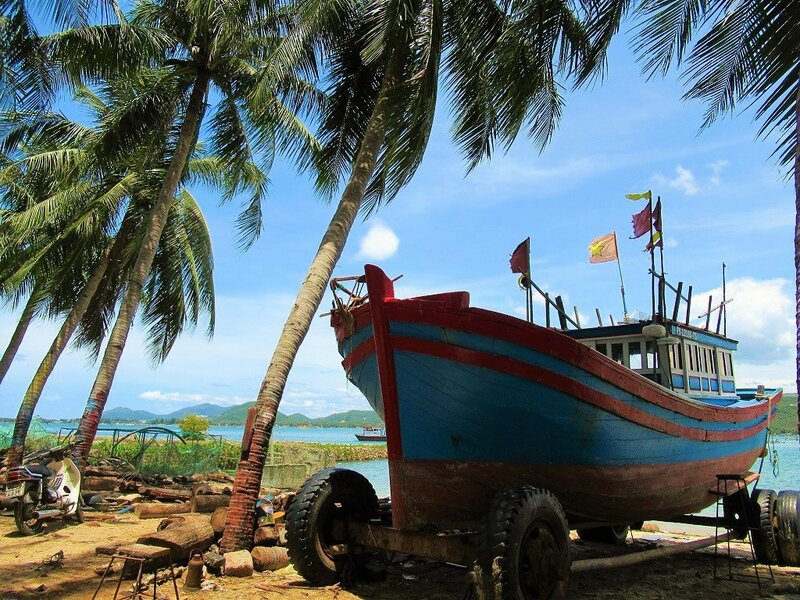 There also are a couple of places in the village which can arrange boats out to Cu Lao Xanh Island. 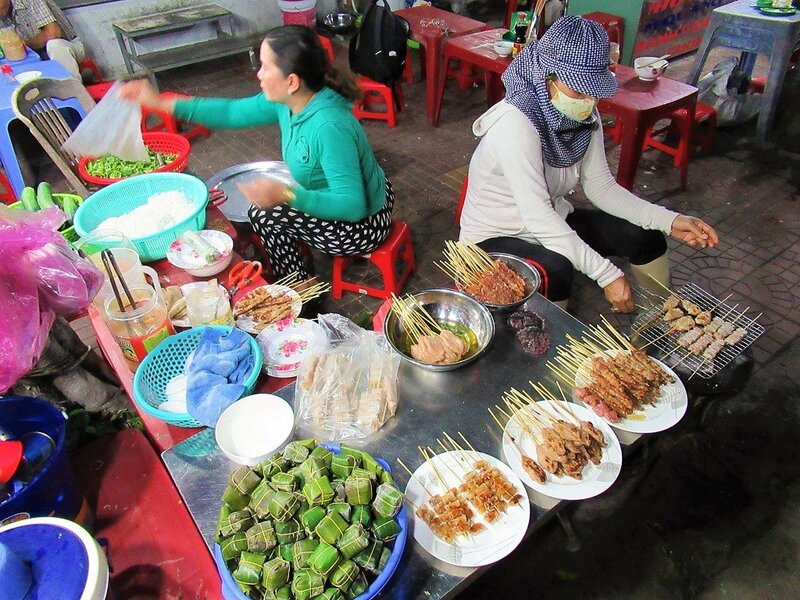 Although there aren’t many dining options on Vinh Cuu Peninsular, all the villages have a few street food stalls in the mornings and afternoons. Just before crossing the Cu Mong Lagoon, Highway QL1 splits: one branch heads around the western shore of the lagoon, the other follows the eastern shore. 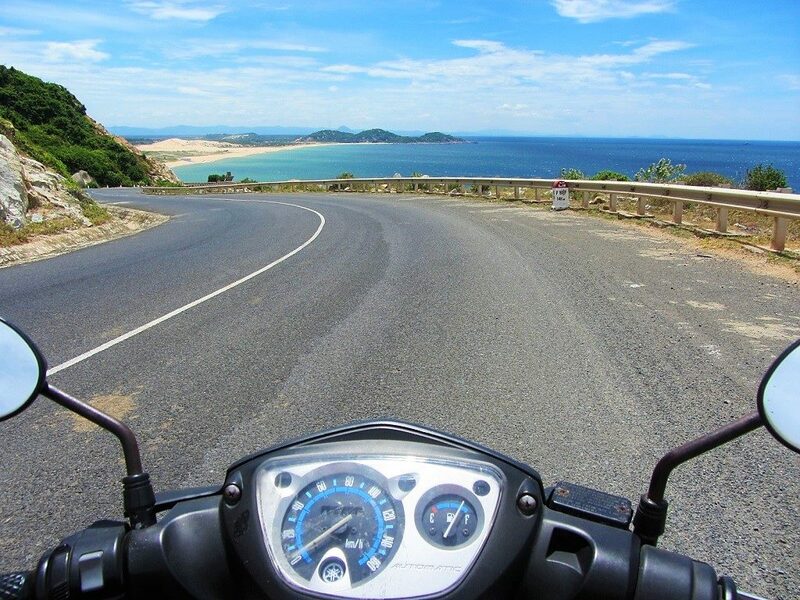 The latter is Highway QL1D, which continues along a spectacular coastline all the way north to Quy Nhon (25km), via several excellent beaches, coves, bays, and islands. Beach hopping here is great fun. The first beach along QL1D is Xuan Hai. This exceptionally long sweep of sand stretches for 1okm, from Xuan Hai village in the north to Xuan Hoa village in the south. Even though very few travellers actually stop and bathe here, Xuan Hai beach is one of the most photographed in the Quy Nhon area. This is because of the gorgeous view afforded of it from the side of Highway QL1D as it curls up the hill north of the beach, opening up a vista down its entire length, with a fleet of coracles and fishing boats pulled up on the sand in the foreground. You can access the beach by taking a steep lane down from Highway QL1D just north of Xuan Hai village (see the red line on my map). Highway QL1D continues north from Bai Rang, sweeping along the coast beneath the impressive, forested slopes of what looks to be an extinct volcano. The next beach is Bai Bau, a beautiful double cove split in two by a rocky headland. At the moment, only the southern cove is accessible, because the northern beach was closed for renovations at the time of writing (June 2018). Accessed via steep lanes, the rocky cove gives way to a spit of white sand surrounded by cashew and mango trees. It’s a beautiful, enclosed little beach, that feels like it’s all your own. The swimming is excellent and staying here is a great option, especially for budget travellers (see Accommodation for details). The next beach along, Bai Bang boasts another attractive arc of sand backed by trees. Unfortunately, parts of the seafront are a bit of a mess at the moment (June 2018) due to the planting of large drainage pipes and the renovation of Hong An Resort, which will soon reopen as Chu Village, complete with some kind of race track (beware noise pollution). However, you can still access Bai Bang at its northern end by taking the lane marked ‘Bai Bang’, where you can buy a drink and have a swim. The lovely beach here is packed with floating lobster farms. There are a couple of accommodation options on Bai Bang. 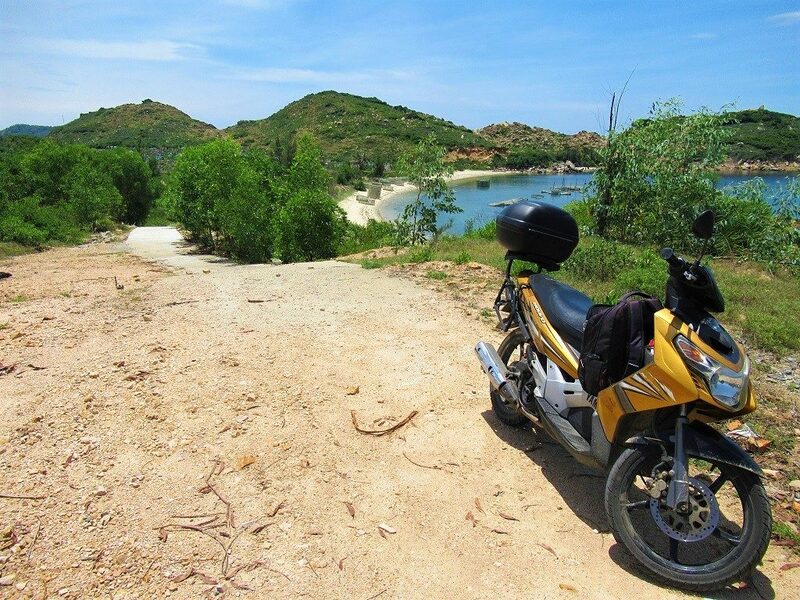 Continuing northwards up the coast on Highway QL1D, Bai Xep Beach is only 10km from Quy Nhon. Although there’s been a steady drip of visitors to Bai Xep for many years, it’s only in the last few that numbers have risen dramatically, and there’s a real buzz about Bai Xep right now. It’s easy to see why: Bai Xep is a double bay bisected by a wedge of land: the south side is the bathing and leisure beach; the north side is the working and fishing beach. Bai Xep hamlet, which is a tangle of tight alleyways, has retained a local feel, and local life continues much as it did before the arrival of foreign and domestic tourists. There’s still some local street food in the narrow alleys and the fishermen still enjoy their seafood-and-beer sessions in the evenings, with karaoke playing into the night. Having said that, the hostels and resorts are increasing at speed, rapidly encroaching – literally bearing down, in some cases – on the village. The alleyways nearest the beach are awash with English-language signs for ‘Laundry’, ‘Western Dishes’, and ‘Boat Trips’. But it’s also fairly harmonious: some of the budget digs have taken residence is old local homes, which are now given a new lease of life (as opposed to the higher-end resorts, which tend to bulldoze everything in their way and then build something new which claims to echo local culture). Also, local people make up a good percentage of the service staff here. The budget scene on Bai Xep is undeniably cool, trailblazing, and extremely good value for money. Travellers to Bai Xep can get their cocktails, espressos, home-cooked meals (European and Asian), beautiful beach, and slice of local life – it’s all right here, right now: this is Bai Xep’s time. But one wonders how long it will stay this way. All around the hamlet, land has been cleared for the construction of huge resorts and residences. Enjoy it while you can. There’s a great range of accommodation in all price categories, most of which have excellent bars and restaurants with sea views (see Accommodation for details). And, lying offshore is the long, rocky island of Cu Lao Xanh, which most accommodations can arrange a boat trip to. The water on the island is superb, and there’s good coral, too. Highway QL1D continues north from Bai Xep along the coast, until the road veers inland behind Quy Hoa village and beach. There’s a good view of the beach from the road as you round the cape, with its long, casuarina-lined sands stretching towards a rugged headland. Take the wide new road leading east off the highway to Quy Hoa village and beach (see the red line on my map). There’s easy access to the beach along the seafront road. It’s a pretty spot which is empty during the daytime but pleasantly bustling during the late afternoons, when locals make the short trip from Quy Nhon to bathe in the sea and play on the sand. In the southern corner of the bay, the enormous, hyper-modern, and very unexpected International Center for Interdisciplinary Science & Eduction (ICISE) looks (and sounds) like something out of a Dan Brown novel. But the most fascinating aspect of visiting this area is the village itself. Quy Hoa was a leprosy hospital, established by French Christian missionaries in the 1920s, and still functioning, to some extent, today. (Leprosy in Vietnam is now fully contained and under control: most all of the patients here today were admitted long ago). The grounds are expansive, peaceful, beautiful, and fascinating. Although it might not sound like it, wandering around the grounds (which is also a local village, inhabited by generations of the families of former patients) is both an interesting and contemplative experience. Quy Hoa is an aesthetically appealing place: very lush with wide, tree-lined avenues dotted with statues of Christian icons. There are hospital buildings dating from French colonial times, houses from the 1960s, churches, cemeteries, and the tomb of a Vietnamese mystic poet, Han Mac Tu, who died of leprosy here in 1940. The long, palm-fringed sandy beach, lined with the sculpted busts of famous doctors from history, is a beautiful backdrop. Patients walk and work around the grounds – you can stop and have a chat (if you speak some Vietnamese or have a guide as translator with you), and people are very warm and welcoming. It’s a strange, time-capsule of a village. Indeed, it reminds me of Con Son town, in the Con Dao Archipelago. And that makes me think: Con Son was a town built under French colonial rule to facilitate the imprisonment, torture and execution of political prisoners during colonial rule; Quy Hoa was a town built under French colonial rule to facilitate the treatment and research of a terrible illness affecting many Vietnamese. Two different (but also overlapping) sides of empire, I suppose: the political and the religious. 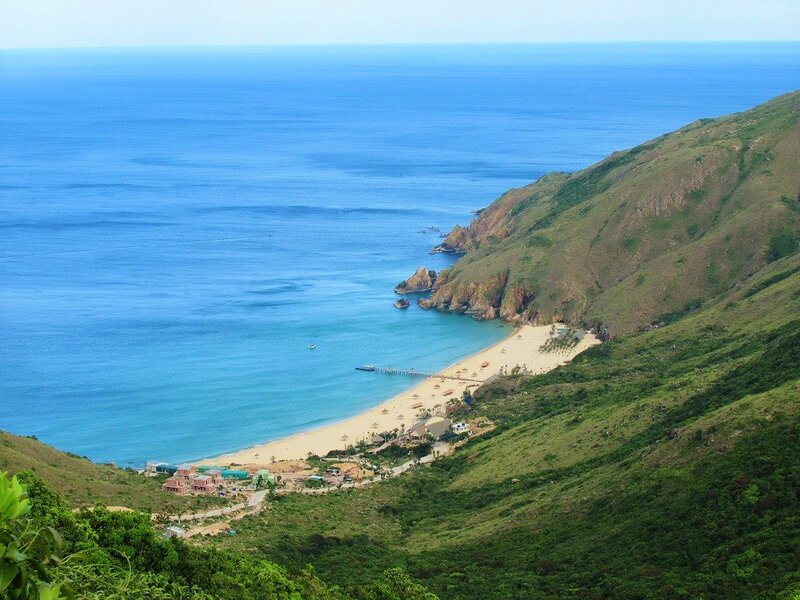 Separating Quy Hoa village and Quy Nhon city, the Ghenh Rang bluff protrudes into a calm bay. A rocky hill covered in eucalyptus trees, Ghenh Rang is a local tourist spot: Quy Nhon residents come to the rocky cove here, called Bãi Hoàng Hậu (Queen’s Beach), to bathe. However, it’s nothing like as appealing as the other beaches nearby. A walkway leads around the bluff, linking Quy Hoa and Quy Nhon. Or, if you’ve got wheels, you can weave around the headland on small roads and down into Quy Nhon (see the red line on my map). 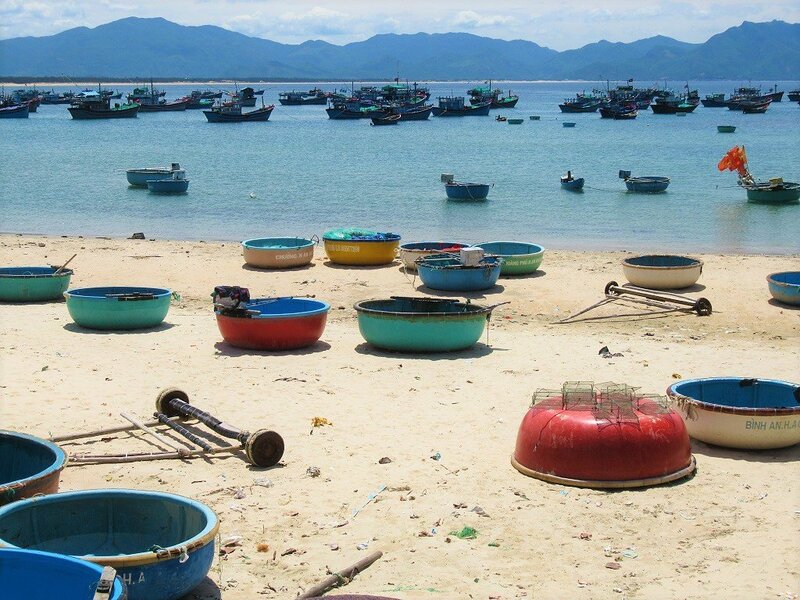 Quy Nhon is one of Vietnam’s most pleasant coastal cities. There’s none of the razzmatazz and tourist mayhem of Nha Trang, and none of the hideous, mega-scale development of Danang. 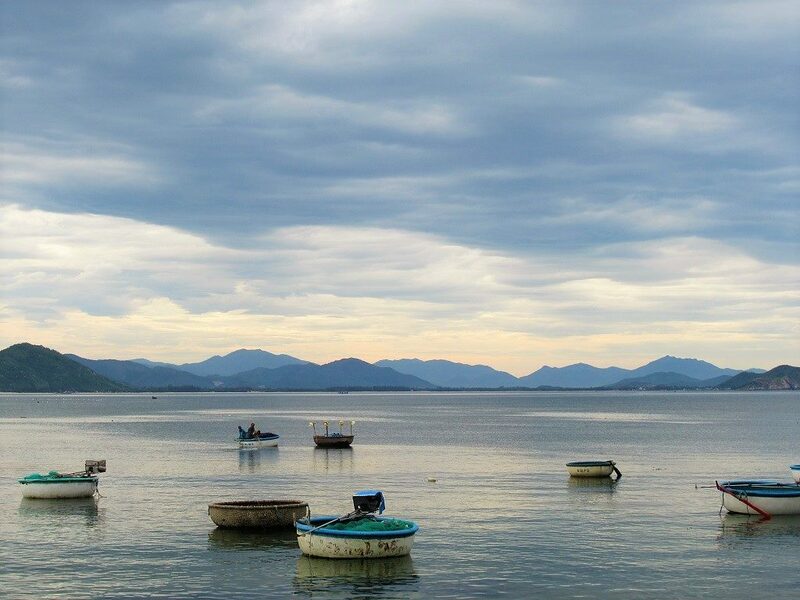 Quy Nhon is simply a Vietnamese city by the sea. There’s a great, long, wide municipal beach, amazing seafood, a good range of accommodation options, lively boulevards and buzzing back-streets. 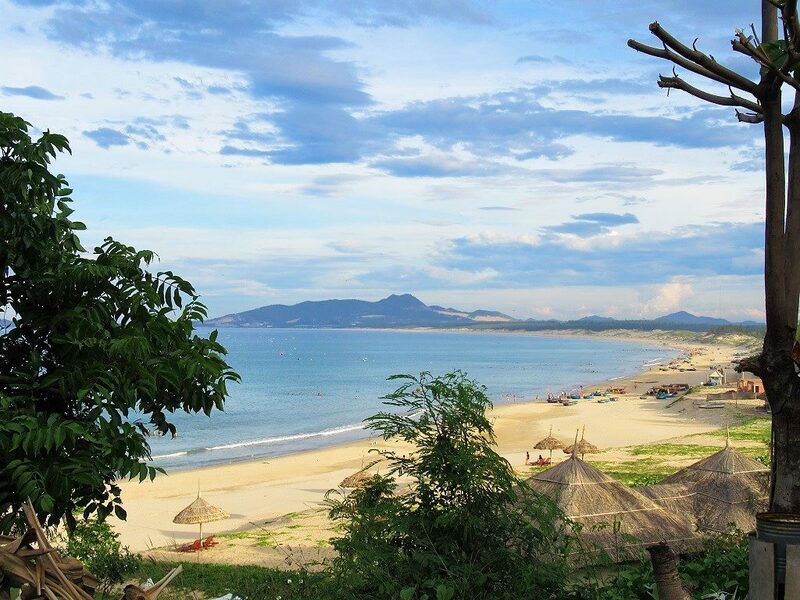 In short, there’s a lot to like about Quy Nhon. And yet, it still only receives a trickle of foreign visitors (although it’s now very popular with Vietnamese travellers). 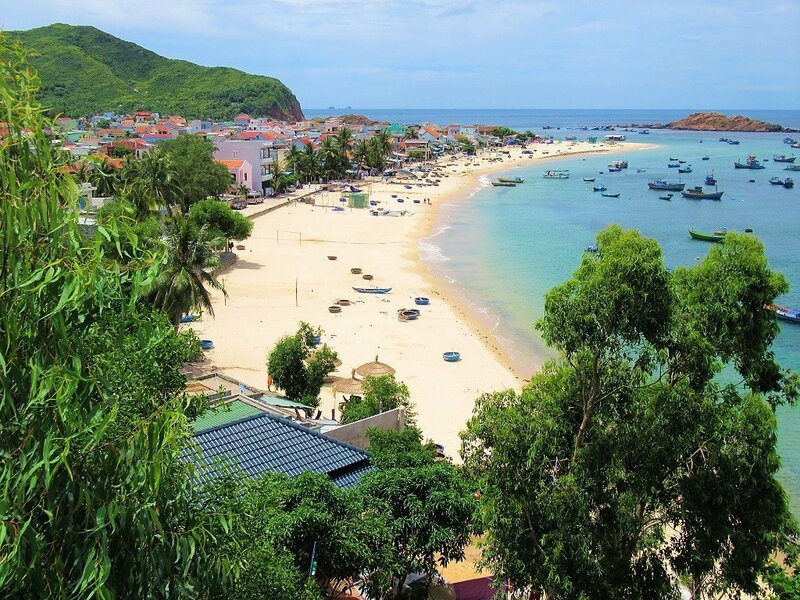 Things are bound to change, of course: already the cranes are busy pulling high-rise apartments and hotels up from their foundations, and it seems inevitable that Quy Nhon, and it’s surrounding beaches, will become one to the stars of Vietnam’s beach scene. For now, there’s an intoxicating, optimistic, happy and playful mood to this city. I’ve always loved it, ever since I first visited on my bicycle in 2005. 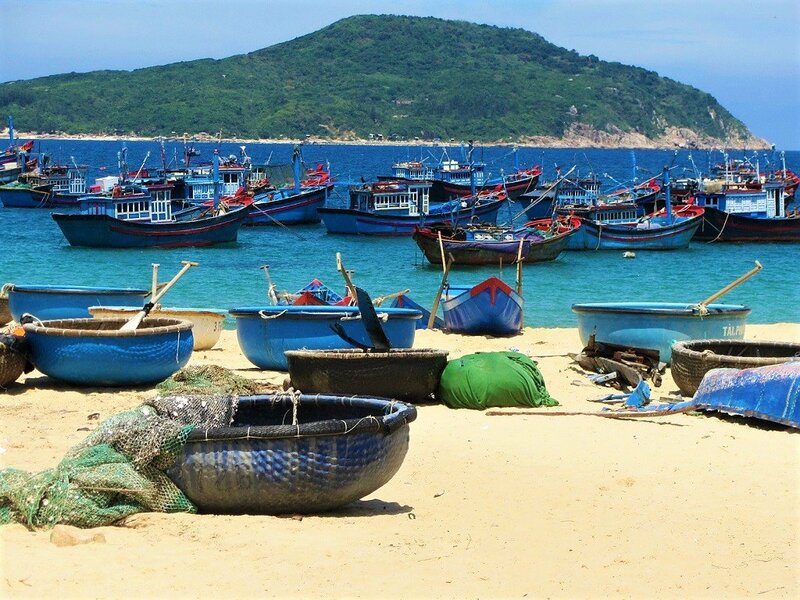 Most travellers who make it here are charmed by Quy Nhon, and it’s a good place to base yourself to explore the city, the outlying beaches and islands, and Cham towers. 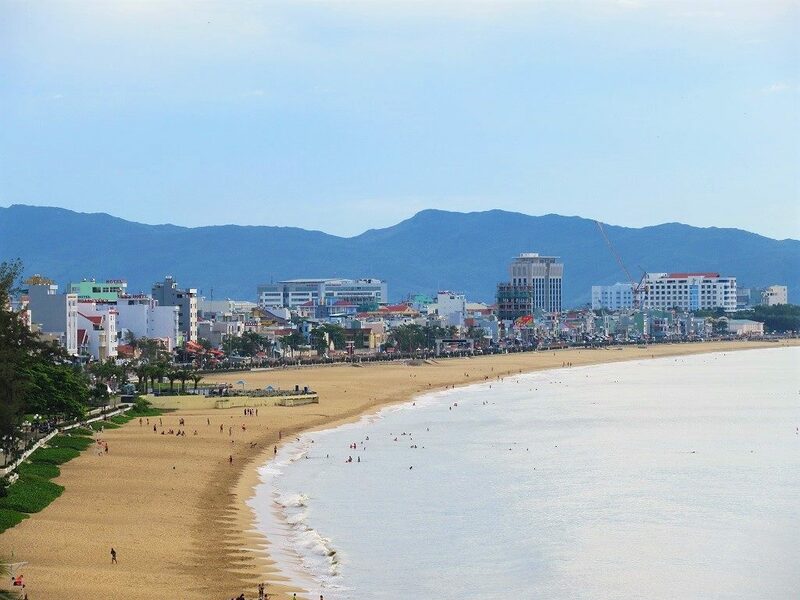 As the capital of Binh Dinh Province, transportation connections to/from Quy Nhon are good, and most travellers to the region will end up spending at least one night in the city. There’s plenty do during your stay. The municipal beach spreads between the Ghenh Rang bluff in the south to the mouth of the Thi Nai lagoon in the north. Its wide sands and calm waters are well-used by locals in the mornings and late afternoons, but during the day it’s empty. The seafront S-Blue Cafe and Surf Bar 1 & 2 are the places to go for sunset cocktails on the beach. Xuan Dieu street runs along the northern half of the city beach. The seafront promenade here is lined with juice and smoothie vendors from late afternoon, and in the evenings some of the best seafood in Vietnam is served at many of the informal restaurants lining the street. My personal favourite is Út Tèo, and I thoroughly recommend a seafood feast here one night. Later in the evening, the T.O.P Pub is a popular hangout for locals and tourists alike: the drinks flow until midnight. 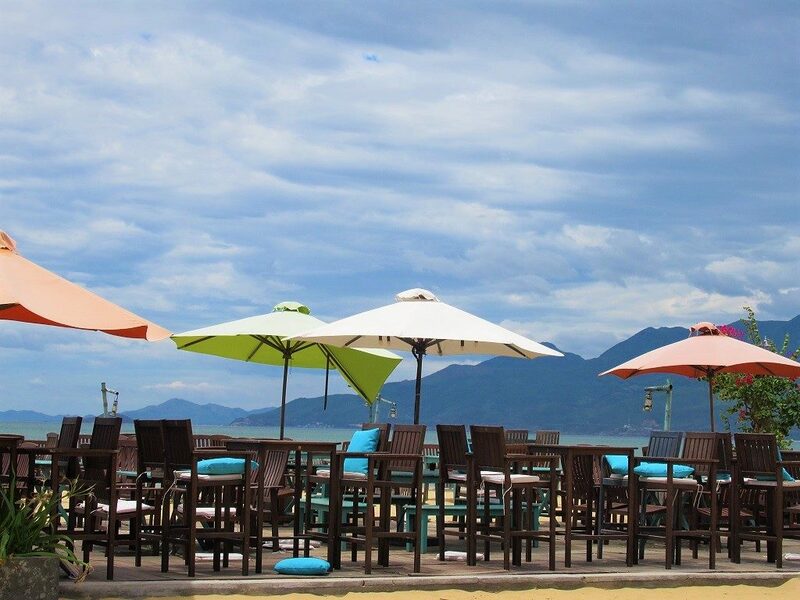 Quy Nhon has a decent and growing cafe culture. Sample the range of coffee shops in the ‘Cafe Quarter‘, at the intersection of Do Doc Bao, Hoang Dieu, and Pham Ngoc Thach streets. 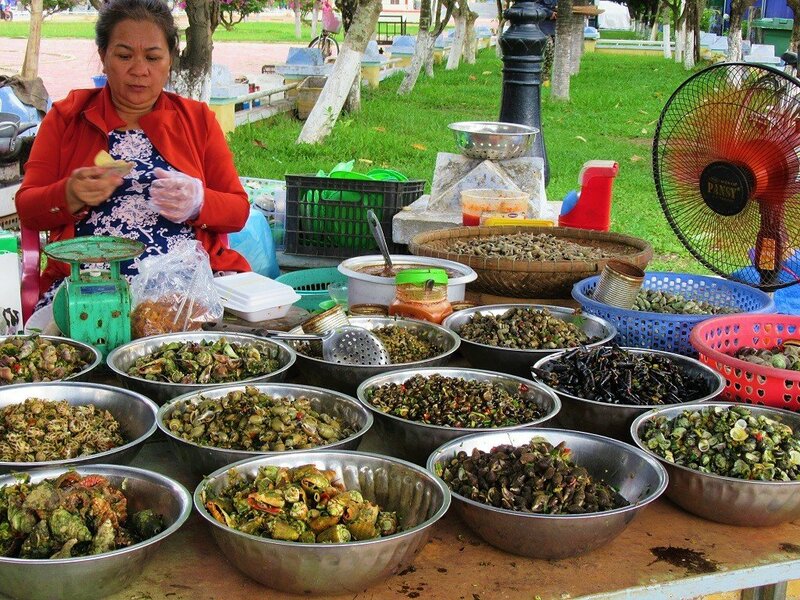 Apart from seafood, Quy Nhon has a lively street food scene. One of the dishes it’s famous for is bún cá, a spicy fish soup. You can find it all over the city, but Ngoc Lien is a firmly established local favourite. To really explore the street food in this city, head to Ngoc Han Cong Chua street in the evening, which is buzzing with food stalls. 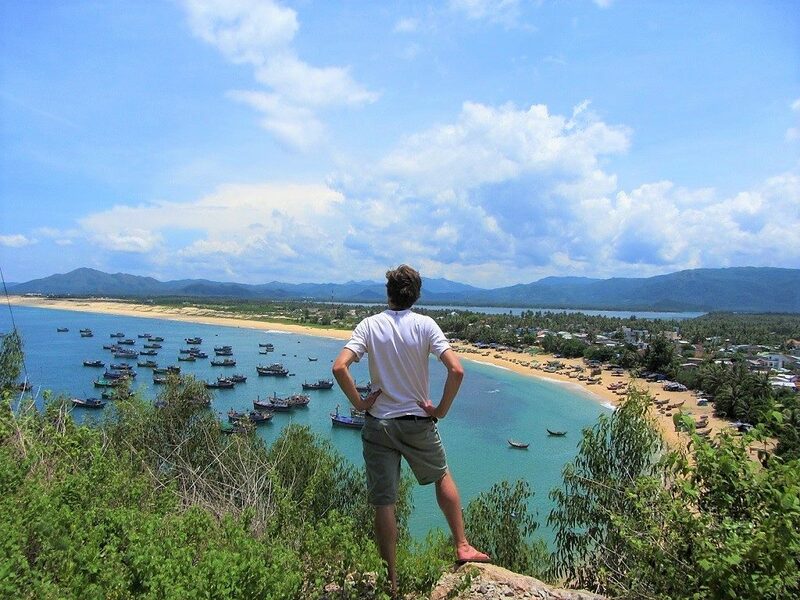 Across the Thi Nai Lagoon from Quy Nhon, via one of the longest causeways in the country, the Phuong Mai Peninsular is a wide, rugged, sand-swept area with some of the most amazing coastal scenery anywhere in Vietnam. Ever since the new QL19B road opened several years ago, people have slowly been discovering this strikingly beautiful promontory. As access has gotten better, so more and more previously hidden beaches have opened to visitors. Despite some major investments, tourist development is still in its infancy. But all the infrastructure is already in place, meaning you can get to almost all the beaches and islets in this region. Crowds are large on weekends and holidays, but other than that, visitor numbers are reasonable and general cleanliness is good. 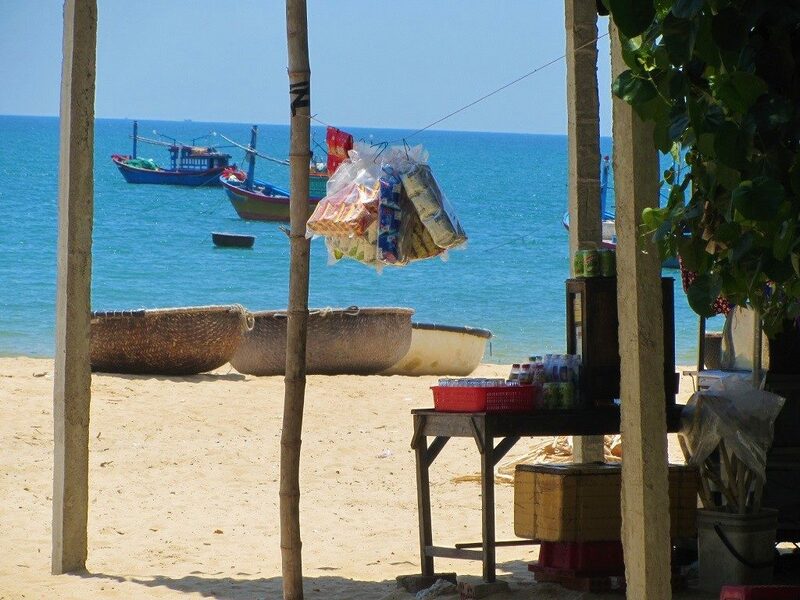 But it’s on the cusp: this year (2018) in particular has seen a surge of social media buzz about the beaches of Phuong Mai Peninsular. On the right side after crossing the causeway over to the peninsular, Cua Bien (Seagate) is an adventure theme park with a climbing wall, zip line, kayaking on the lagoon and other water-related activities. Continue straight ahead on wide empty roads and turn down a small, concrete lane heading to the southern tip of the peninsular, to Nhon Hai fishing village. 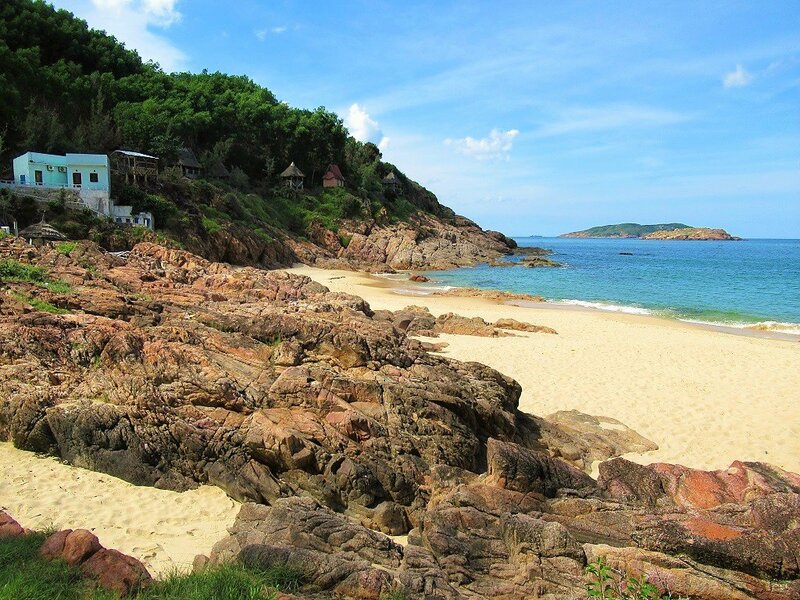 A scruffy little place with an end-of-the-line feel, Nhon Hai occupies a fabulous position on a crescent sand bay hemmed in by cliffs, with a couple of rocky islands just off shore. The sea here is an attractive turquoise colour. Boats take visitors on short snorkeling trips to the islands and floating restaurants. A new, elevated road is under construction around the cliffs south of the village, which will eventually lead to the long, white sands of Hai Giang Beach just behind the headland. 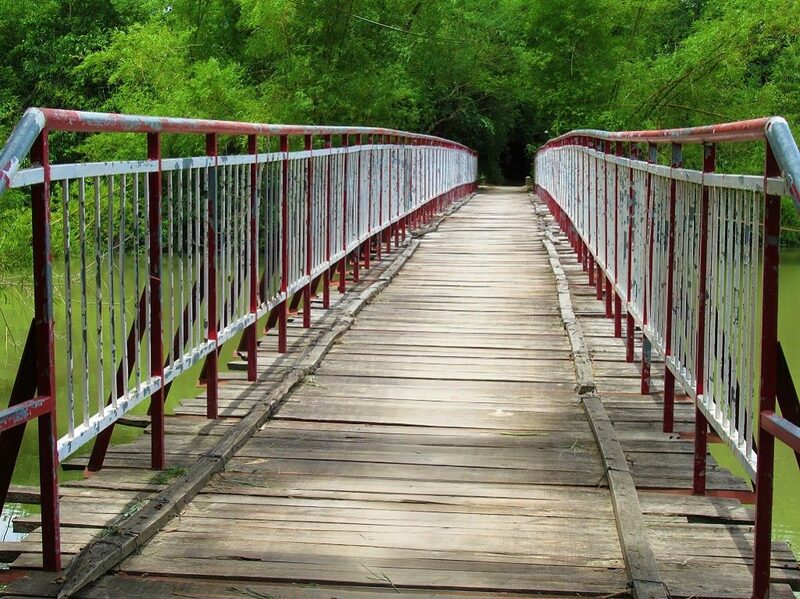 (Hai Giang can also be reached by road from the north, but at the time of writing the road was in bad condition.) Wandering through the village is interesting, and there are a couple of Buddhist temples. At the southern end of Nhon Hai beach, there’s a good hostel (see Accommodation for details). The northern end of the peninsular is reached via the wide and empty Highway QL19B, which slices through a sandy, arid landscape. A turn off leads to the hideous and humongous new FLC Resort complex, complete with golf course and safari zoo, probably the first of many such developments in this area. On the other side of the resort, three fishing villages – Eo Gio, Nhon Ly, and Xuong Ly – cluster around the base of a barren outcrop. There are attractive beaches on either side of the headland, where dozens of blue-painted wooden fishing boats lie at anchor. The villages themselves are fascinating and rough around the edges. A tangle of narrow passages weave from one side to the other, like a medieval village. Buddhist pagodas, monuments, and colossal statues dot the villages and hillsides. Pathways criss-cross the arid hills, affording marvellous views. There are plenty of seafood restaurants to choose from here, and it’s very popular with Vietnamese visitors, who come by the busload. But in the tight alleyways, it’s easy to lose the crowds. 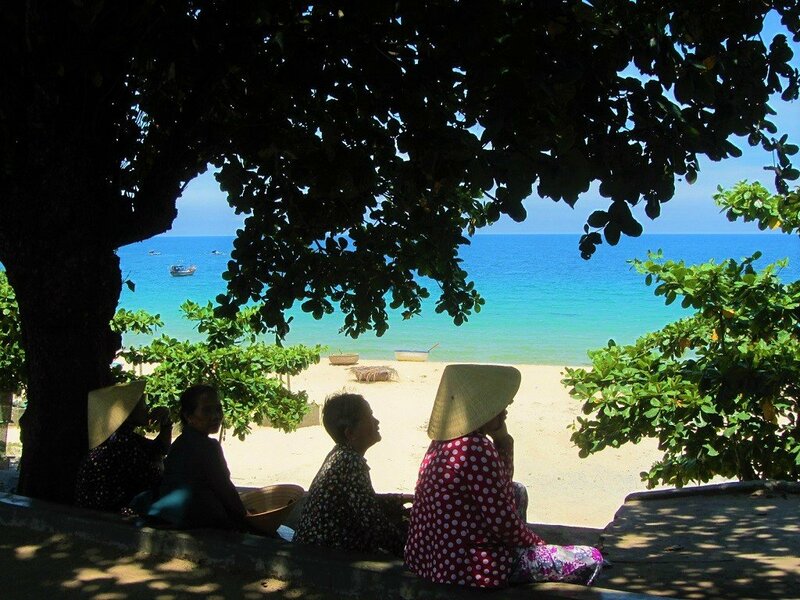 Personally, I find Xuong Ly, on the south side of the headland, the most attractive and least touristy of the villages. Most people simply refer to the villages and headland as Eo Gio. It’s one of those places that wasn’t on the tourist radar until very recently, and now finds itself the centre of attention for domestic travellers and foreign investors. There’s a fair amount of hassle on the streets by touts, and overcharging of foreign visitors is quite common. Most restaurants and guest houses offer boat trips to the nearby islets, such as Hon Seo, where there’s good snorkeling and bathing. 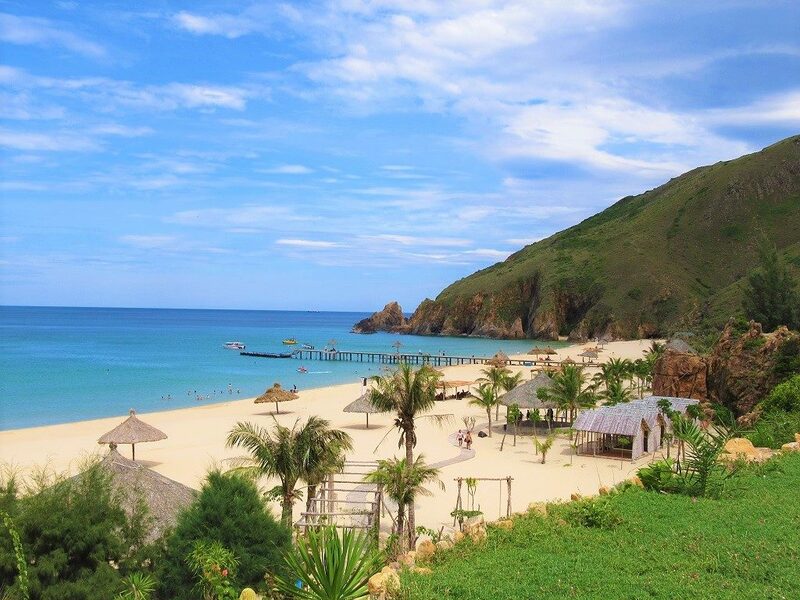 Probably the most talked about beach in Vietnam right now, Ky Co is a drop-dead gorgeous wedge of white sand between two giant rocky buttresses, which isolate the beach completely. 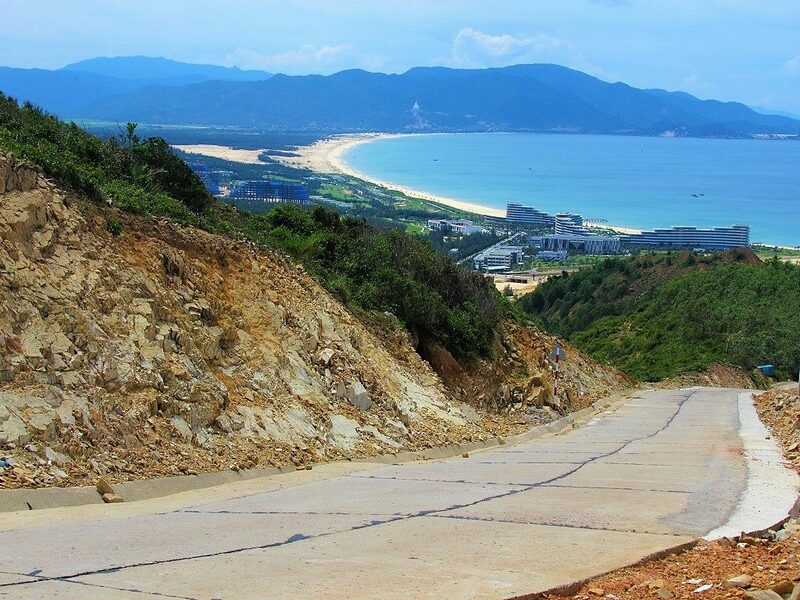 Until recently, it was only possible to access Ky Co by boat (chartered from Eo Gio, Nhon Ly, Xuong Ly or Nhon Hai villages), but now there is an absurdly steep and scenic road running atop the cliffs south of Eo Gio, before descending almost vertically to the beach itself. It’s possible to drive as far as the parking lot, after which you must transfer to a 4×4 for the final descent (or walk). Parking is 5,000vnd; entrance is 60,000vnd; and the transfer is 40,000vnd. But, trust me, it’s worth it. Ky Co justifies the hype it has received over the last year. The first glimpse of it really is jaw-dropping. Ky Co is already very popular with domestic tourists, but if you spend the hours between 1-3pm at Ky Co and walk to the far south end of the beach, you should have it largely to yourself. Vietnamese travellers, unlike many Western ones, like to be where the action is: on Ky Co this is at the centre of the bay, where the boats come and go at the pier, photography kiosks take your picture on the sands, a beach restaurant serves food (and techno music), and jet skis can be rented. But stroll further down the beach, and you’ll find it much more peaceful. There are caverns and pretty little coves at the far end, too. The water is perfect for bathing and there are showers, changing rooms, bamboo-and-thatch huts, and a couple of snack outlets. Litter is not yet a problem, because staff are employed to go around constantly picking up the trash that people discard on the beach, and because Ky Co has a no outside food and drink policy. A resort is currently under construction at the northern end of the beach, and change, I guess, is inevitable. This is a sort of ‘soft opening’ for Ky Co: a period of time when anyone can visit, before the luxury resorts take over. The money shot of Ky Co Beach is actually above the bay, before you reach the parking lot. On the ocean side of the road, at the crest of the hill before dropping down to the car park, there’s a communications tower. The ledge here affords a panoramic view down over Ky Co: get your cameras ready. At the northern end of the empty expressway (QL19B) running the length of the Phuong Mai Peninsular is Trung Luong beach and village. Beautifully situated at the north end of the the long, arcing beach stretching all the way from Eo Gio, Trung Luong is backed by boulder-strewn hills and a gigantic seated Buddha presiding over the entire bay. Walking the hundreds (I didn’t count the exact number) of steps up to the Buddha is great exercise and you’ll be rewarded with astonishing views across the bay, all the way back to Quy Nhon. Below the Buddha, Trung Luong village is a mix of concrete box homes and older, tile-roofed houses from the 1980s. Exploring its backstreets is interesting, especially in the late afternoons when street food is available here and there. The beach itself is very attractive and good for bathing. The new, tasteful Crown Resort is great for a cocktail overlooking the sands (see Accommodation for details). From Trung Luong, coastal roads DT640 and DT639 curl along a beautiful stretch of ocean, past some tantalizing beaches and bays. 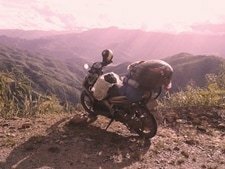 The ride from Trung Luong all the way to Tam Quan (90km), where the road ends as it meets Highway QL1A, is a glorious road trip if you have your own wheels. There’s little in the way of tourist infrastructure, but the scenery is fantastic, the beaches are golden, and the rewards for those who travel it are huge. For a map of this stretch of road and the coast beyond it, all the way to Hoi An and Dong Hoi, take a look at my Coast Road guide. The following accommodation options are listed as if travelling from south to north along the Phu Yen and Quy Nhon coast; corresponding to the same place names as my list of beaches above. All the accommodation options below are marked on my map. I’ve included everything from guest houses to hotels, resorts to hostels, camping to luxury residences. You can support this website by booking hotels through the links on this page (see below for details). *Please support this website by using the BOOK HERE links in the hotel listings to reserve your accommodation on the island or by using the search box below. All my reviews are independent and I never receive money in return for writing about a hotel. Thank you. Although there’s no real accommodation options in Vung Ro Bay at this time, it is possible to camp on Mon Beach, and this is a great way to spend a night. Just to the right, after going through the entrance gate to Mon Beach and passing the bridge, a little concrete path leads down to a small, corrugated-iron-roofed structure, called Quán Chú Mười. Run by a pleasant Vietnamese couple, two-man tents are available to rent for 100,000vnd ($4) a night. Or, if you have your own tent, you can pitch it for free (you just have to pay the 20,000vnd entrance fee). Depending on the weather conditions, you’re free to make camp anywhere on the grounds, including right on the glorious, wide, golden sands of Mon Beach, next to the sapphire-coloured surf. This is excellent value for budget travellers, and there can be few better located campsites in Vietnam. 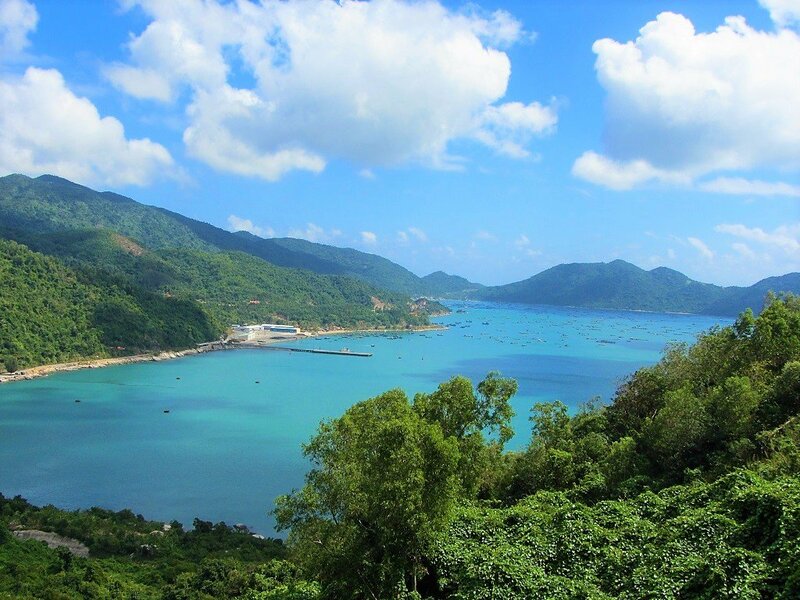 Tuy Hoa has a good range of accommodation options for all budgets. 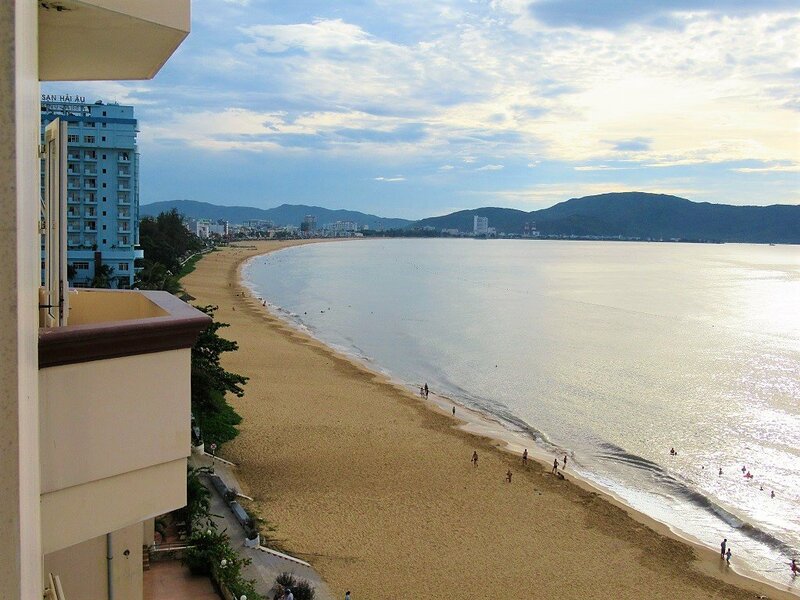 Most of the places to stay are around Hung Vuong Street, which is just a few blocks from the beach. Although there are several hotels right on the beachfront road (Doc Lap Street), they are generally big, soulless edifices, aimed at domestic tour groups. However, a hotel building boom is set to commence on the beach in the near future. 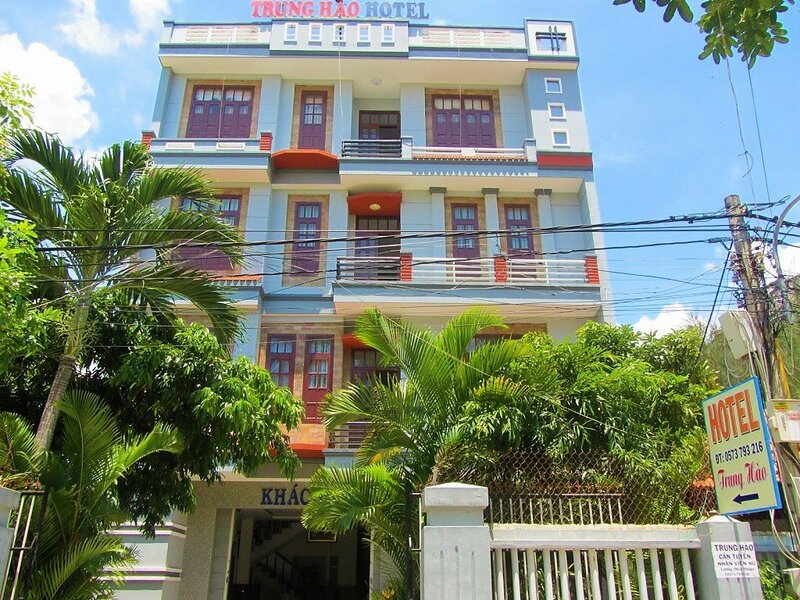 • Budget Mini-Hotels: $10-$20; [MAP] – Hong Ngoc, Thanh Lam, and Thanh Long are all good, clean, cheap mini-hotels with private rooms and bathrooms. • Violet Hotel (0573 793 477) & Trung Hau Hotel (0573 793 216): $10-$15; [MAP] – These mini-hotels are a stone’s throw from Long Thuy’s beach, both offering decent rooms at reasonable prices, some with balconies looking out to sea. 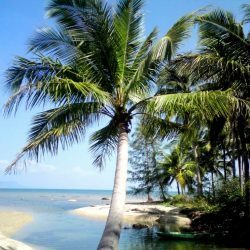 There’s currently no accommodation on Bai Xep Beach and Ganh Ong Cliff (although, if you’re lucky, you might be allowed to camp for the night). The nearest accommodation is VietStar Resort and the mini-hotels in Long Thuy village: see above for details. 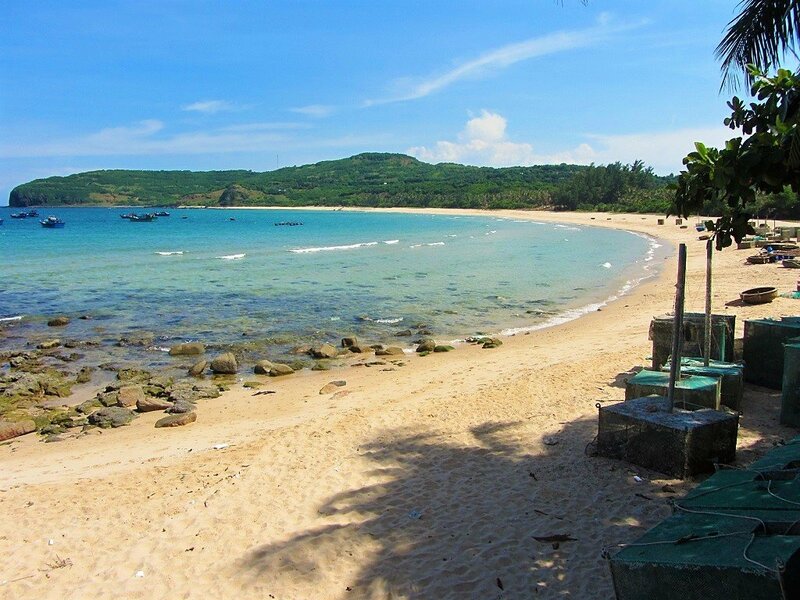 For the time being, there’s no accommodation on Mui Yen Cape or Yen Beach. However, I expect that a couple of simple guest houses (nhà nghỉ) and homestay-style places will open up very soon, on account of the increasing number of budget travellers on motorbikes who are beginning to explore the area. 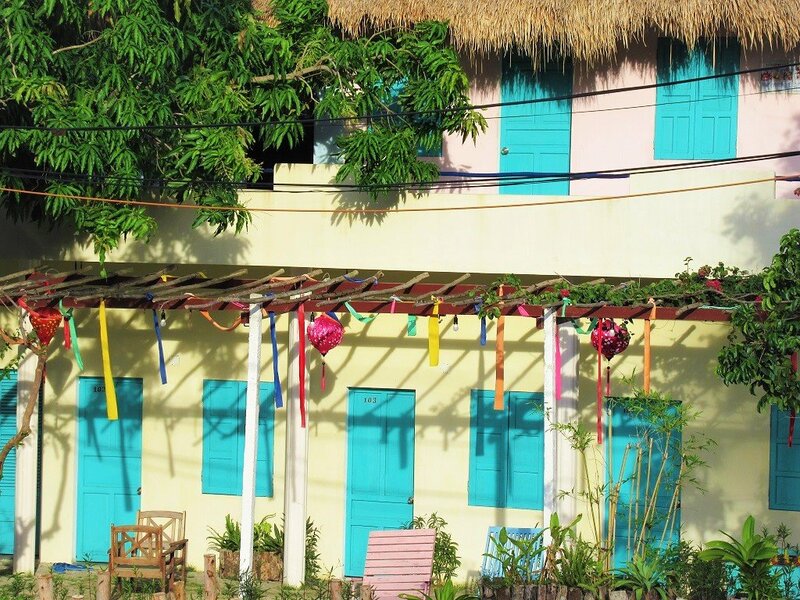 For now, head to Long Thuy or Tuy Hoa for a place to stay the night. There’s no accommodation on An Hai Beach at the moment, but it’s sometimes possible to arrange for camping overnight on Mai Nha Islet. However, it’s best not to count on this. Again, the nearest places to stay are Long Thuy or Tuy Hoa. Surprisingly, considering it’s popularity among domestic tourists, there aren’t really any accommodation options near the Da Dia Cliffs. There are several signs for nhà nghỉ (local guest houses) in the area, including Chi Thanh on Highway QL1A, but none that I saw were particularly worth mentioning. I’m sure a few places to stay will pop up soon, though. In the past, I’ve camped on the grassy hills near the lighthouse. For now, most visitors to Da Dia come as part of a day trip from Tuy Hoa or Quy Nhon. 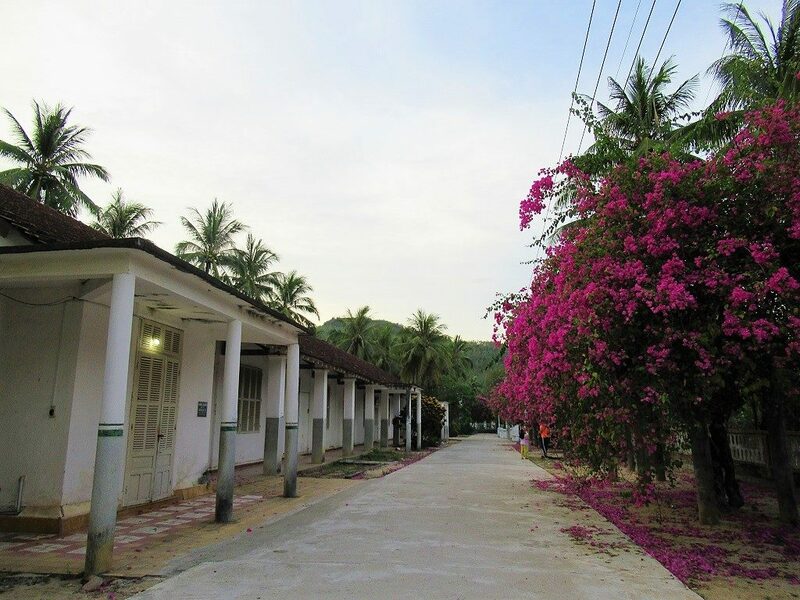 There are several nhà nghỉ (guest houses) by the roadside as Highway QL1A passes by Ganh Do Beach. 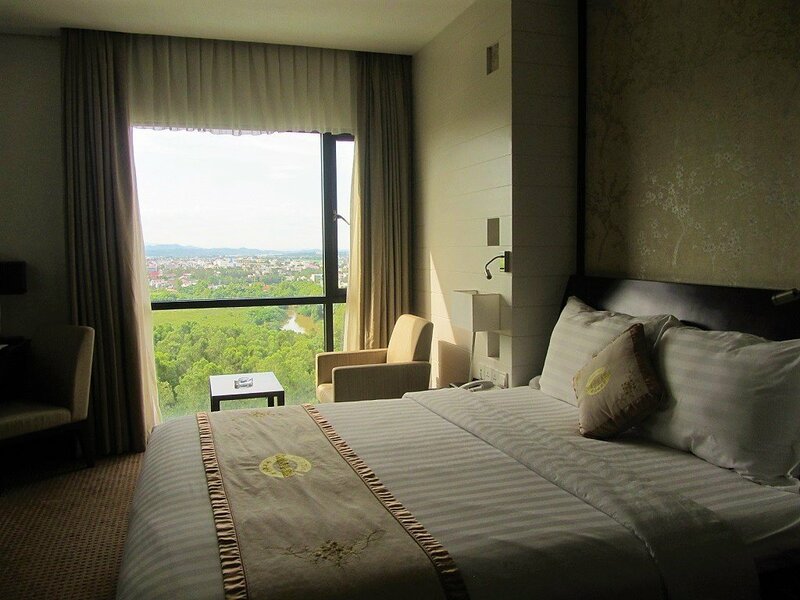 Nha Nghi Hung Mai (tel: 0257 3699 999) has large, clean rooms for around 200,000vnd ($10) and is fine for a night. 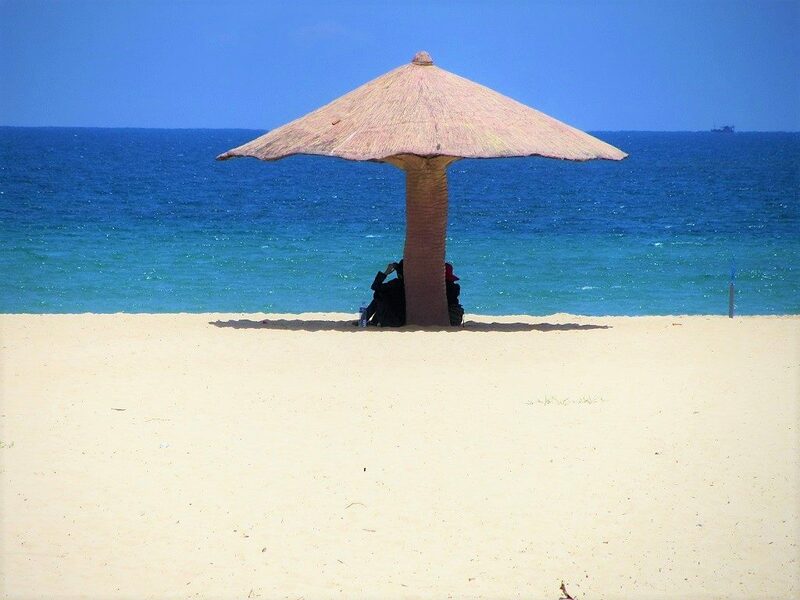 It’s also possible to stay right on the beach at Biet Thu Ganh Do (tel: 091 827 17 75), which has a good location on the seafront. A few minutes further up the road, Kim Gia Trang (tel: 0573 743 134) is a large and ornate roadside guest house. 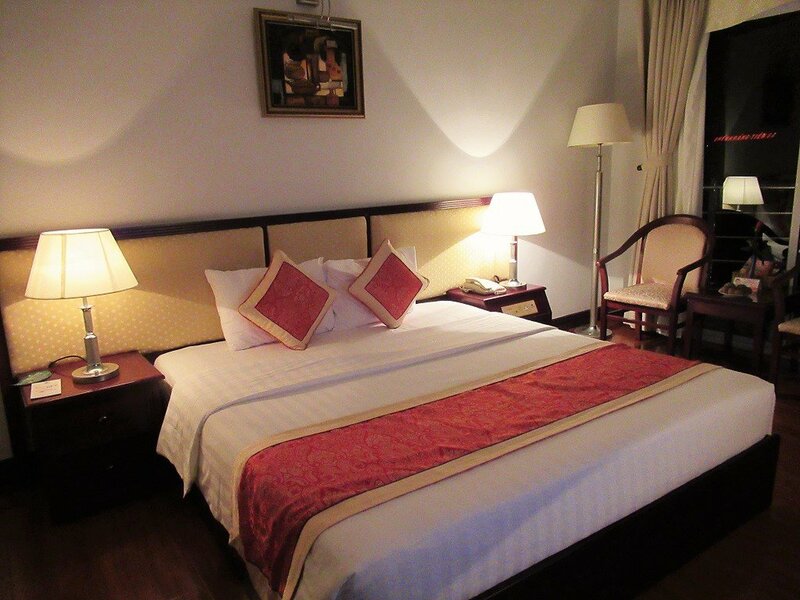 In Song Cau, Laura Hotel (tel: 0257 3728 879) is on the edge of town, with decent rooms for around $15. But there are also a couple of guest house along the highway north of town, including AStop (tel: 0257 3876 768) which has chalets and an infinity pool right on the Xuan Dai Bay. 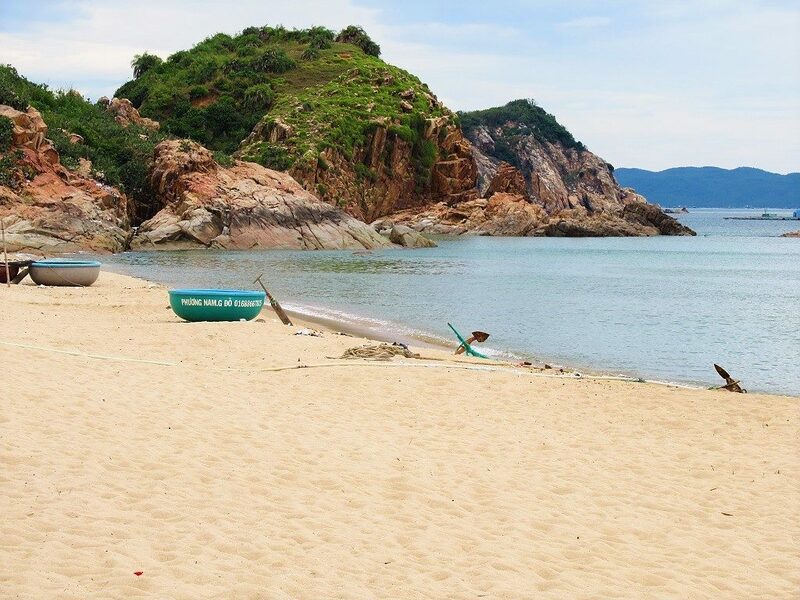 So far, there are only a couple of accommodation options on the beautiful long, empty beaches of Xuan Thinh Peninsular. 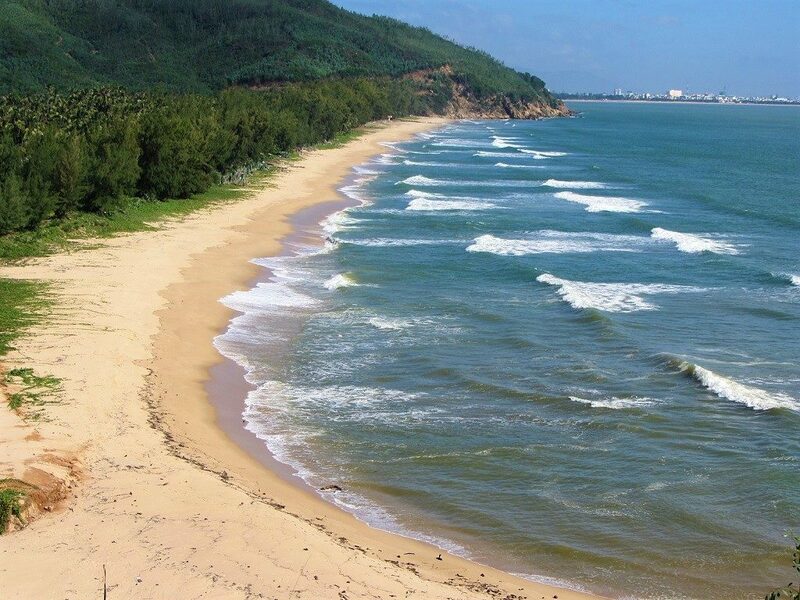 They are right next door to each other on the sands of Vinh Hoa Beach, at the northeastern end of the peninsular. Both offer good, fairly simple, clean, and affordable rooms/dorms on a glorious stretch of palm-backed sand. This is the very early stages of tourism in this area, so come now and see it in its infancy, because things are only going to getting bigger. As well as the following two accommodations, you can find plenty of great ‘wild camping’ spots on Xuan Thinh Peninsular, if you have your own equipment with you. 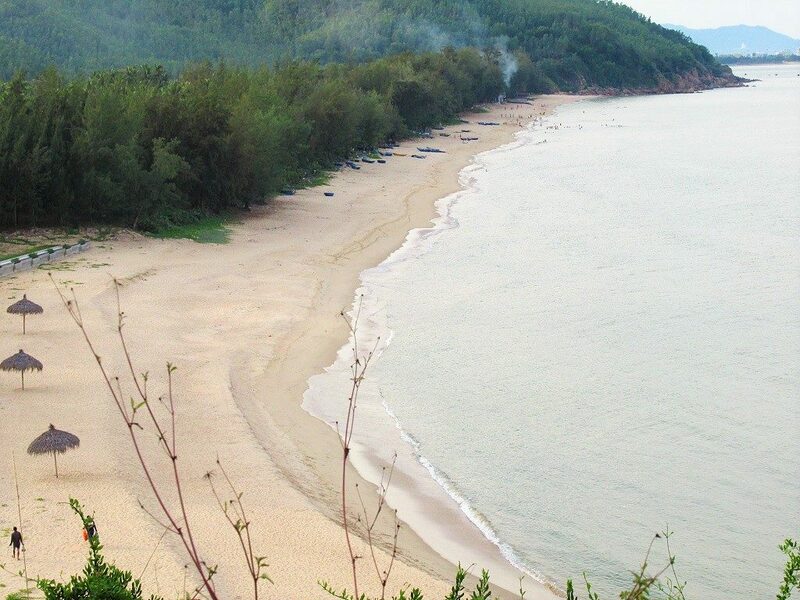 There’s nowhere to stay on Vinh Cuu Peninsular yet: locals call it a ‘free beach’ (bãi biển tự do). 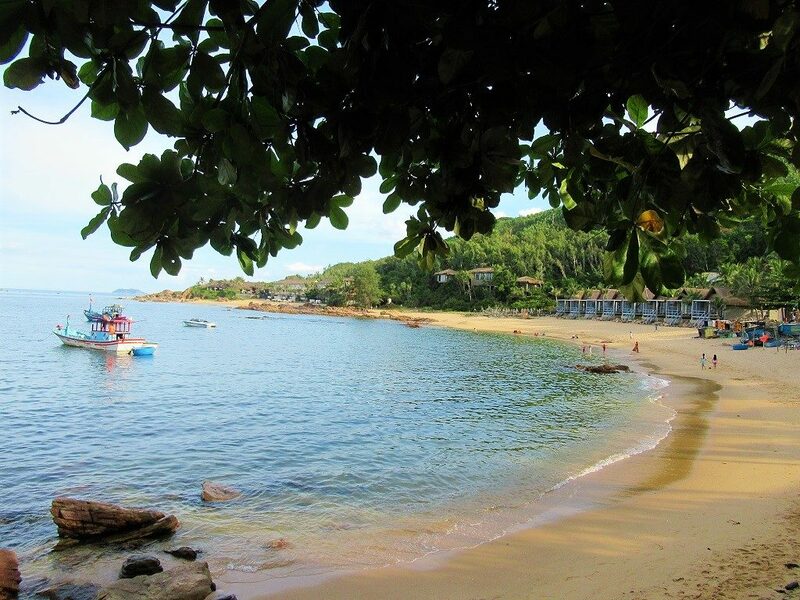 However, if you’re lucky you might be able to camp on the beachfront at Hoa Thanh village, where there are showers and a couple of seafood shacks. But, if you’re a foreign traveller, you’ll probably need to register with the local authorities, and this can sometimes be a problem. Bai Tram Hideaway Resort is currently undergoing a major expansion and will be closed for the foreseeable. When it eventually reopens, I’m sure it will be lovely, but very exclusive. On Bai Rang Beach there is nowhere to stay but, if you’re lucky, the owners of the beachfront eatery might let you camp (with your own tent). 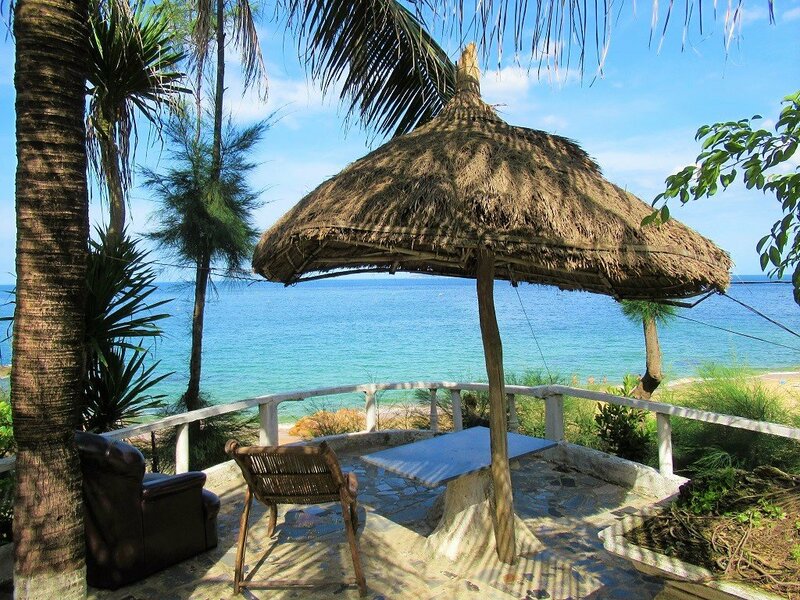 The other option on Bai Bau Beach is Trung Duong (tel: 0983 615 873), just up from Life’s A Beach. Here there are shabby but cheap (200,000vnd) bungalows near the beach. But it’s difficult to find a reason to stay here over Life’s A Beach. The second of Bai Bau’s coves is taken up by Bai Bau Resort. However, this was undergoing repairs at the time of writing (June 2018) and showed no signs of reopening soon. 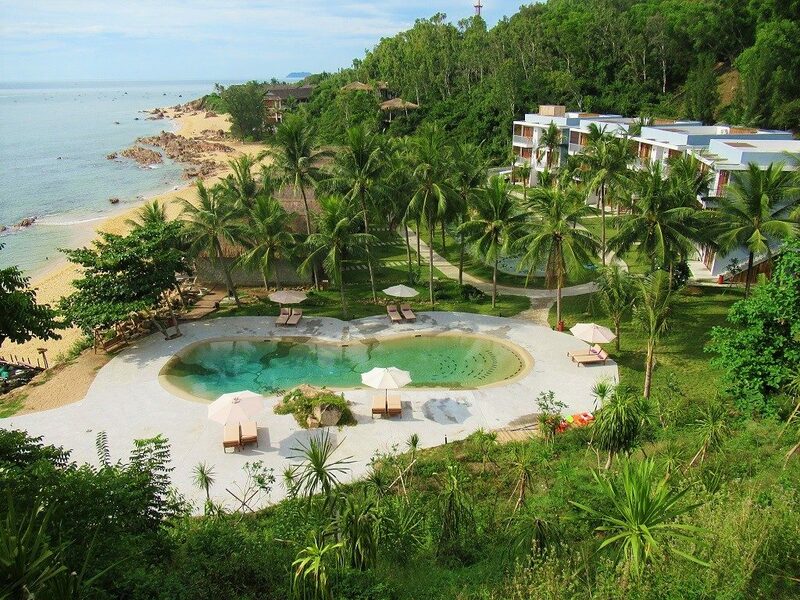 Bai Bang Beach is the site of Chu Village Resort (tel: 0903 872 728). Currently being refurbished, it should be open by the time you read this. I wasn’t able to take a proper look around, but the new renovations seemed to include some kind of a race track, which was already disturbing the peace of this area. A bit further up from Chu Village, Cat Homestay (tel: 0888 188 179) is a new place with only a handful of clean, simple, cheap (200,000-350,000vnd) rooms set around a garden. It’s by the roadside, but there’s easy access to the beach via a shady lane. Next door, follow another lane to Bai Bang Resort where the owners of the cafe/restaurant should let you camp on the beach for around 200,000vnd a night (the resort itself wasn’t open at the time of research due to renovations). 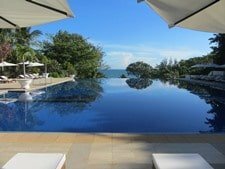 • AVANI Resort & Spa: $120-$200; [MAP] – This long-running high-end resort (formerly the Life Wellness Resort) was refurbished a few years ago, and since then has become extremely popular. Rooms are spacious, bright, clean, and classy. They’ve found the right balance of modern and traditional – there’s even some echoes of Cham architecture. The pool is lovely and the resort has a large slice of Bai Xep beach. But most of all, the location is fabulous: looking out over the bay with the islets and fishing boats dotting the water: [BOOK HERE]. Just south of AVANI, the Anantara Resort is under construction, which promises to be another classy, high-end accommodation. • Casa Marina Resort: $60-$100; [MAP] – A new addition to the Bai Xep accommodation scene, Casa Marina is a sprawling complex of rooms and bungalows. Easily recognizable by its distinctive, giant, thatched-roofed reception (it looks like some kind of bamboo space craft), Casa Marina has huge but stark and empty rooms, most with great sea views. There’s a pool, lots of beachfront, and gardens, but it has none of the intimacy of the mid-range options on Bai Xep, and lacks the classiness of AVANI: essentially, Casa Marina fills the price gap between the two. It’s perfectly fine and pleasant enough for a short stay, but perhaps not that memorable: [BOOK HERE]. 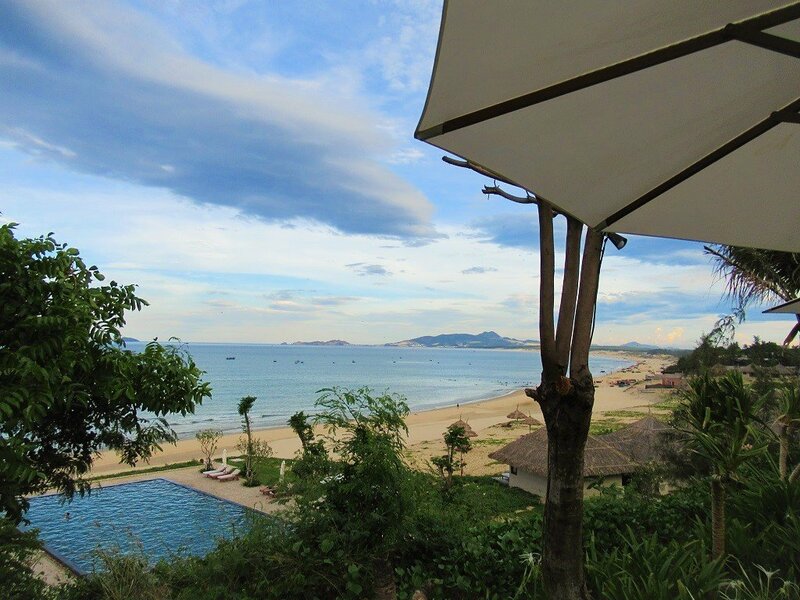 Just north of Bai Xep, O.Six Resort has recently opened on a very lush section of beachfront land [MAP]. • Eo Gio Guest Houses: $10-$20; [MAP] – There are a few local guest houses (nhà nghỉ in Vietnamese) in Eo Gio village and on the seafront. I don’t find any to be particularly good, but if you want to stay here, just head down to the beachfront lane and check out what’s available. Apart from the two places listed below, there are several cheap local guest houses (nhà nghỉ in Vietnamese) near the intersection of roads QL19B and DT640 in Trung Luong village. 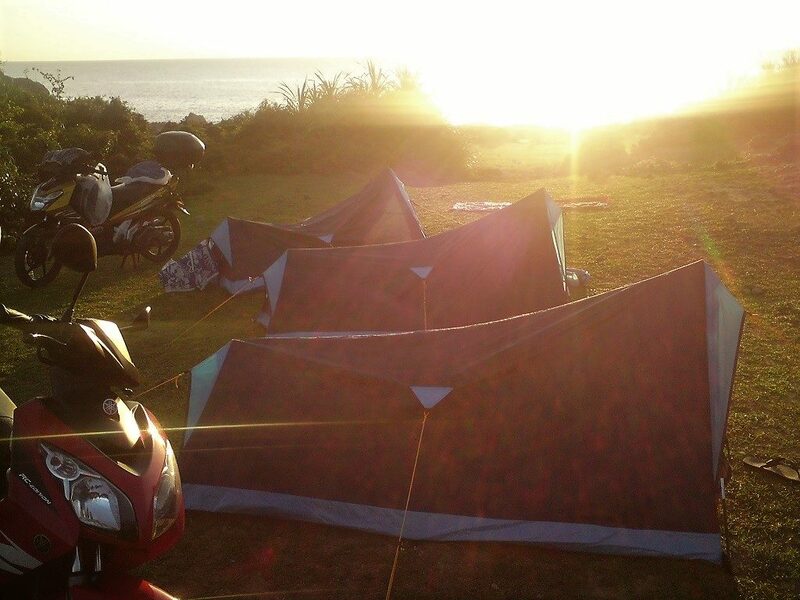 • Trung Luong Camping: $5-$20 | Tel: 094 209 0909; [MAP] – Just a couple of minutes beyond Trung Luong village on the wonderful ocean road, Trung Luong Camping is great value for budget travellers. Offering tents or little private chalets for very reasonable prices, Trung Luong Camping attracts a young Vietnamese crowd on weekends, but is quite empty during the week. The position is amazing: squeezed between boulders on a rocky bit of coast with access via a pathway to a secluded beach. There’s a bar and food, too. Popular regional dishes include cơm gà (chicken rice), bánh xèo (filled savoury rice flour pancakes), bánh căn (savoury rice flour cakes), bánh bèo (savoury rice batter flans), bún cá (fish noodle soup), and chả cuốn (filled fresh spring rolls, also called bánh cuốn in this part of Vietnam), all of which you’ll see by the roadside, particularly from the afternoon onwards, in almost all towns, villages, and hamlets. Look out for the signs in Vietnamese and dig in. A plate of any of the above rarely costs more than a dollar or two (20,000-40,0000vnd). In general, food is spicier in coastal Central Vietnam, which is often attributed to the legacy of the Indianized ancient kingdom of Champa, which flourished in this region between the 11th and 15th centuries. (For recommendations of specific street food stalls, see the markers on my map, or the individual descriptions of each of the beaches). 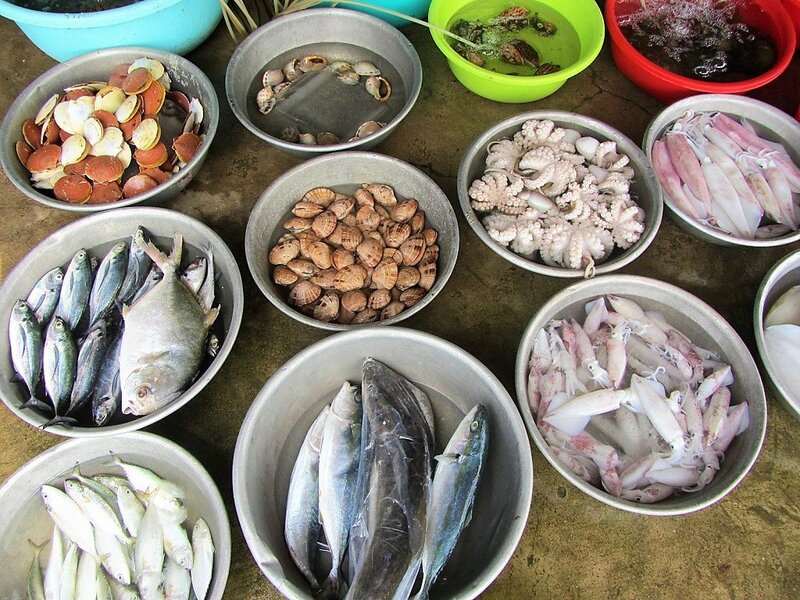 Seafood is a highlight of visiting this stretch of Vietnam’s coastline. The seafood here is fresh, varied, reasonably-priced, and delicious. Prepared in hundreds of different ways, Vietnamese are expert seafood cooks. There are lots of clusters of classic, informal Vietnamese seafood restaurants (quán hải sản) throughout the area that this guide covers. From floating restaurants in beautiful bays to bustling eateries on city seafronts, they are all fabulous places to dine. I’ve marked several clusters of seafood restaurants on my map and mentioned them in my descriptions of specific beaches. As an example, Út Tèo restaurant, on the seafront road in Quy Nhon, serves some of the best seafood I’ve ever had in Vietnam. Seafood is best enjoyed in a group; it’s not really something you can indulge in if you’re travelling solo. Ordering can be difficult, because of the variety of dishes and the absence of English translations at most restaurants. However, with an open and adventurous palate, and being willing to make some mistakes, you should be able enjoy many a seafood feast while travelling through Phu Yen and Quy Nhon. 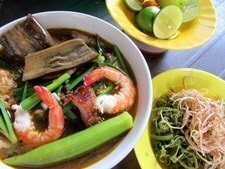 Because Phu Yen Province and Quy Nhon aren’t yet popular tourist destinations, there isn’t much Western food available. However, there are a few good options if you’re craving some home comforts. 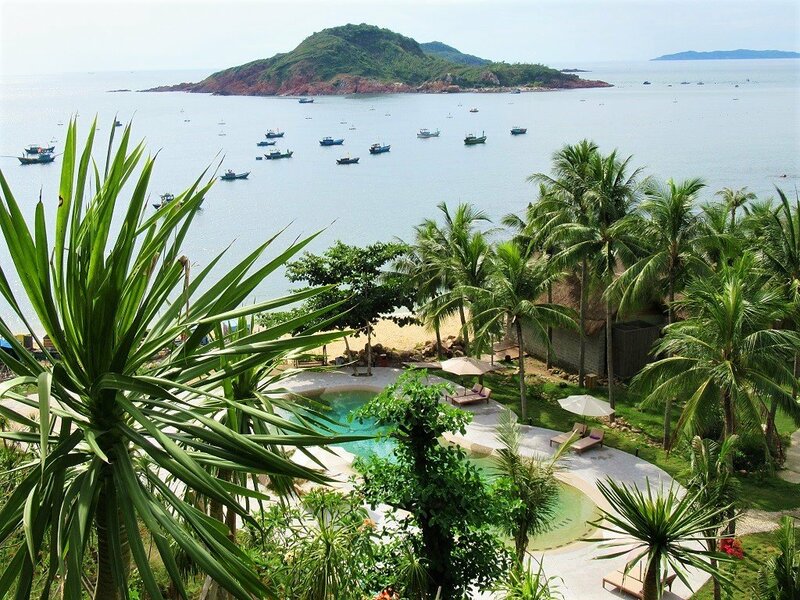 Quy Nhon and Bai Xep beach both have a decent range of Euro-US fare, as do all the higher-end accommodations in this region. There’s even one or two unexpected Western joints, such as Bob’s American Cafe on the back streets in Tuy Hoa. 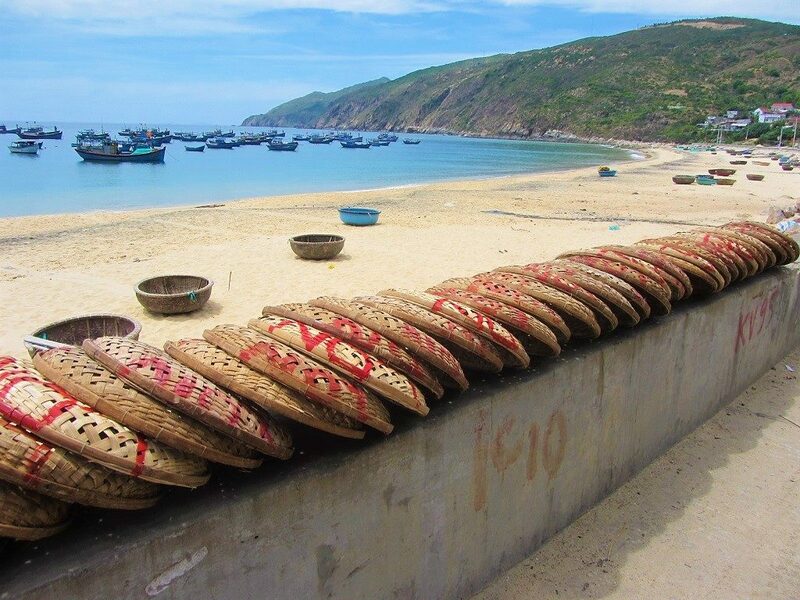 *Please support Vietnam Coracle: you can search all transportation options to Phu Yen and Quy Nhon and make bookings directly from this page by using the Baolau.com search boxes & links throughout this guide. If you make a booking, I receive a small commission. All my earnings go straight back into this website. Thank you. Phu Yen is served by Tuy Hoa’s Dong Tac Airport, across the Da Rang River south of Tuy Hoa city. Quy Nhon is served by Phu Cat Airport, 30km northwest of the city. Vietnam Airlines, Jetstar Pacific, and Vietjet all operate daily flights between both airports to and from Ho Chi Minh City and Hanoi. Check the airlines’ websites for details or compare flight times and prices on Baolau.com. Taxis and airline shuttle buses connect both airports with their respective cities. As Phu Yen and Quy Nhon become more popular, there will surely be more domestic flights and, eventually, international flights to regional hubs. Tuy Hoa train station is on the main Reunification Express line: almost all north-south trains stop here. 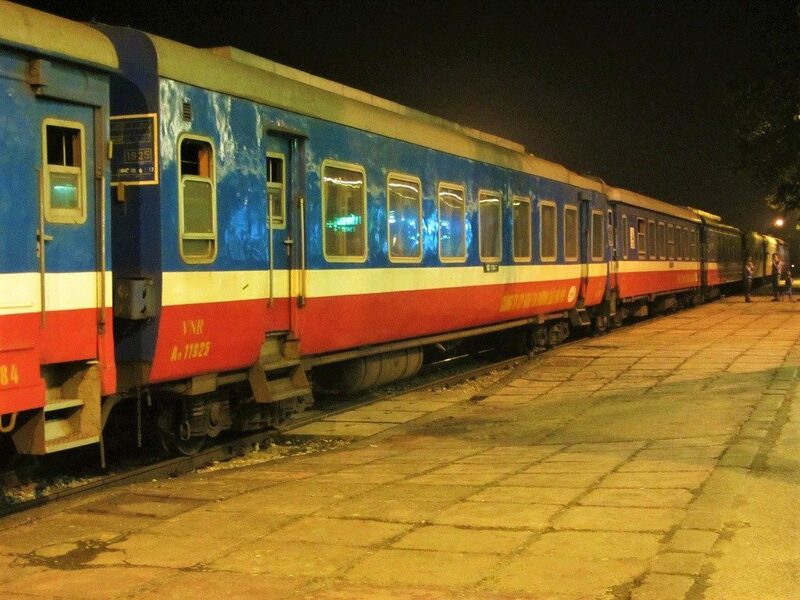 Quy Nhon station, however, is on a spur line, which means that most travellers to Quy Nhon by train will in fact arrive at Dieu Tri station (10km west of Quy Nhon) on the main line, from where you can get a taxi into the city. However, several trains do serve Quy Nhon station directly, including one train a day in each direction between Saigon and Quy Nhon. On the main line, there are around a dozen trains each day in both directions, linking Tuy Hoa and Dieu Tri with Saigon and Hanoi, via all main station stops in between. One of the most convenient and popular trains is the SE4 night train, departing Saigon in the evening and arriving in Tuy Hoa or Dieu Tri the next morning. Check current schedules, ticket prices, availability, and make bookings through Baolau.com or the Vietnam Railways website. Long distance buses connect Tuy Hoa and Quy Nhon with all coastal cities between Saigon and Hanoi, and also many destinations in the Central Highlands. The Tuy Hoa bus station and Quy Nhon bus station are both large but reasonably easy to navigate. Long distance buses, including sleeper night buses, are pretty comfortable these days, although if travelling between coastal cities I still prefer to take the train. If, however, you’re heading to the highlands, you’ll have to take a bus. Prices are reasonable (usually cheaper than the trains) and road connections are getting better all the time. Popular destinations from Tuy Hoa and Quy Nhon include: Danang (6-8 hours), Nha Trang (3-4 hours), Dalat (7-8 hours), and Ho Chi Minh City (12 hours). Compare prices, times, bus companies, and book tickets on Baolau.com. One of the most popular and trusted long distance bus companies is Futa (Phuong Trang): check times and prices on their website. 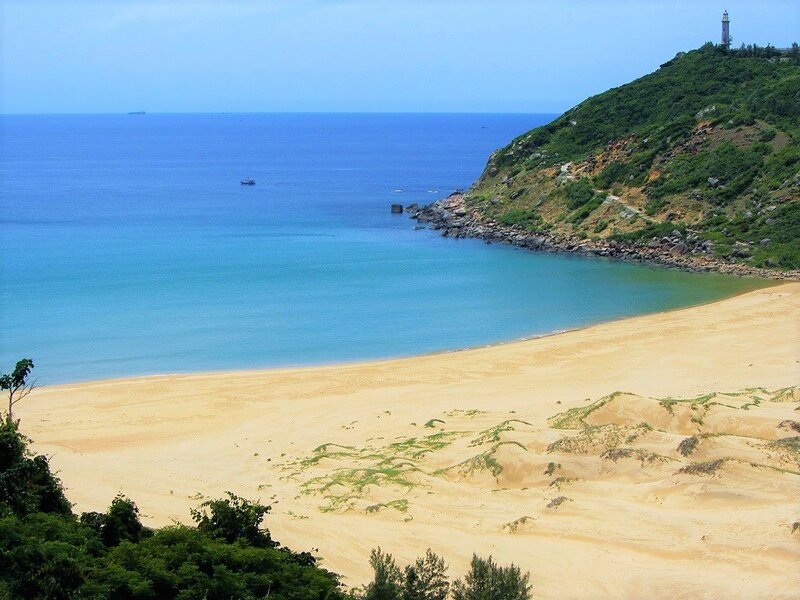 The best time of year to visit the coast of Phu Yen Province and the beaches around Quy Nhon is from March to September. During these months the weather is usually clear, dry, hot and sunny: the kind of weather you expect on a tropical beach. The seas are also calmest at this time of year, making it perfect for swimming. The months from October to February can be windy, wet and surprisingly bleak. The seas can be rough, and this region sometimes lies in the path of typhoons coming in from the east during October and November. 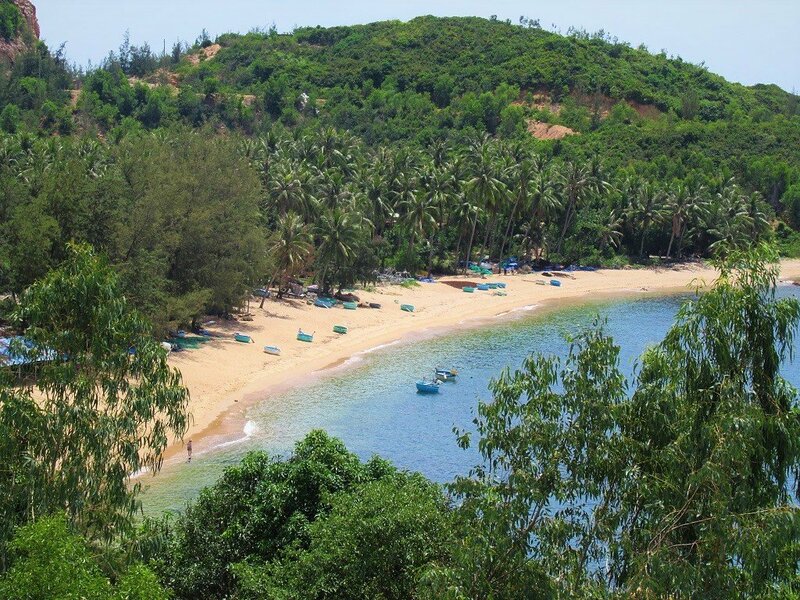 This entry was posted in Beaches, DESTINATIONS, Off Beaten Path, Quy Nhon, The Centre and tagged Bai Xep, beaches, Da Dia, guide, Ky Co, phu yen, Quy Nhon, travel, Vietnam. Bookmark the permalink. Went to check out Ky Co beach last week. If you go with family or a big group and need a homebase for the day, would recommend. Closes at 5pm. Still, road going up the hill is great and beach is clean and has lifeguards. But the price on everything is kind of annoying. Thanks. Yes, Ky Co Beach is lovely and the prices are reasonably. Thank you and exciting to know that you love my country even more than ourselves. Your guide with real experiences are awesome. Your photos are excellent with perfect and art view that can make reader feel hungry to come to these places immediately. BTW, I am an owner of an accommodation in your trips with your highlight home-cooked Vietnamese meals. Let me know when you come back then I can invite you a home-cooked dinner with sea food again. Thank you, I’m glad you like my guides. Hi Tom! 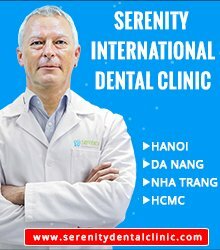 Thank you so much for the best site about my favorite country Viet Nam. I’m really your fan! Have used your site since 2016 and visited amazing places in the north and south of the country. Please don’t stop to please us with splendid articles and acquaint with fabulous roads, mountains, beaches, cuisines and people for sure! Thanks, Alexander. Really great to hear you like Vietnam so much and that my articles have helped you find your way around. Another great post, good observation and insightful view about history of each place . Thank you, Frank, I’m glad to hear you liked it. This is it! 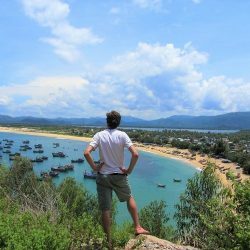 The most awesome beaches guide ever made to one of the most beautiful (if not the best) coastal area of Vietnam. My hat off for the amount of insight you’ve got, Tom! Soon after reading this guide, I’m planning coming back and will touring from Qui Nhon to Phu Yen March next year. 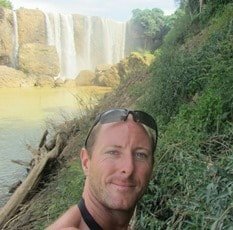 Aside from enjoy reading your article, I keep recalling my sadness for what the Gov should do: instead of taking care of the poor fishing villages in one of the poorest region in central Vietnam and protect the environment; they are busy thinking of how to take over every beaches with penny money to the fisherman and turn into real estate business for them self. So, just like Tom said, go and visit all of this as soon as possible, before the trash and the resort invade all of them. Keep writing Tom! 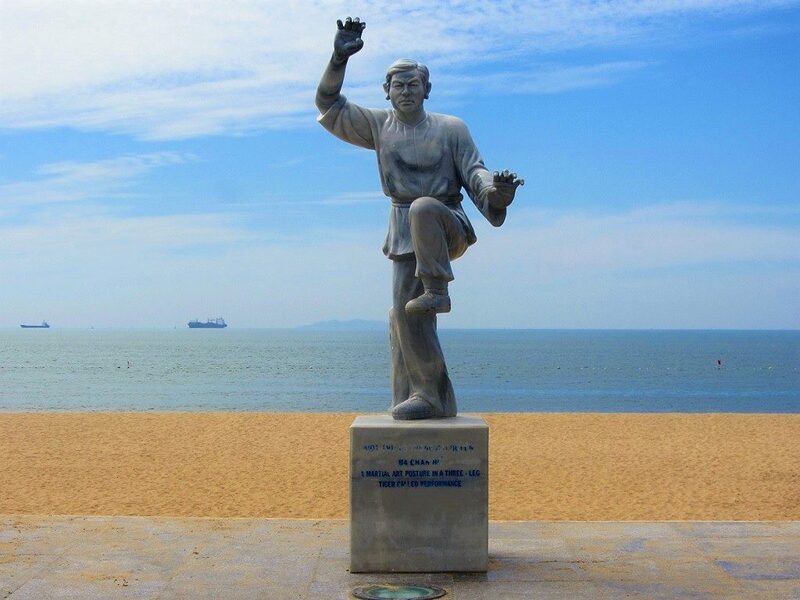 It’s great to hear you enjoyed this guide and like the Phu Yen and Quy Nhon area so much. I hope you enjoy your trip there next March. Epic, Tom! Can’t wait to get to Quy Nhon after reading this. Awesome guide. Yes, it’s a wonderful area, I’m sure you’ll love it.